Copper MCX holds the levels of 100 EMA, any break down we may see correction in copper, Technically on the daily charts we see minor support on the downside for Copper Mcx Future lies in zone of 440- 438 levels, where as minor resistance on the upside is capped around 455- 457 levels. Currently Copper Mcx Future is trading above 200 days exponential moving average and suggests long term trend is bullish. EquityPandit’s analyst predicts range for the week is seen from 460- 462 on upside and 430- 435 on downside. Formation of classical head and shoulder pattern is visible in copper daily charts and any breakout may decisive. Technically on the daily charts we see minor support on the downside for Copper Mcx Future lies in zone of 440- 438 levels, where as minor resistance on the upside is capped around 455- 457 levels. Currently Copper Mcx Future is trading above 200 days exponential moving average and suggests long term trend is bullish. EquityPandit’s analyst predicts range for the week is seen from 460- 462 on upside and 430 -432 on downside. Technically on the daily charts we see minor support on the downside for Copper Mcx Future lies in zone of 430- 431 levels, where as minor resistance on the upside is capped around 455- 457 levels. Currently Copper Mcx Future is trading above 200 days exponential moving average and suggests long term trend is bullish. EquityPandit’s analyst predicts range for the week is seen from 470- 472 on upside and 415- 416 on downside. Technically on the daily charts we see minor support on the downside for Copper Mcx Future lies in zone of 430- 431 levels, where as minor resistance on the upside is capped around 40- 452 levels. Currently Copper Mcx Future is trading above 200 days exponential moving average and suggests long term trend is bullish. EquityPandit’s analyst predicts range for the week is seen from 460- 461 on upside and 415- 416 on downside. Technically on the daily charts we see minor support on the downside for Copper Mcx Future lies in zone of 440- 441 levels, where as minor resistance on the upside is capped around 458-460 levels. Currently Copper Mcx Future is trading above 200 days exponential moving average and suggests long term trend is bullish. EquityPandit’s analyst predicts range for the week is seen from 472- 470 on upside and 432- 430 on downside. Technically on the daily charts we see minor support on the downside for Copper Mcx Future lies in zone of 448- 445 levels, where as minor resistance on the upside is capped around 468- 470 levels. Currently Copper Mcx Future is trading above 200 days exponential moving average and suggests long term trend is bullish. EquityPandit’s analyst predicts range for the week is seen from 485- 487 on upside and 432 430 on downside. As we have mentioned last week, that minor support for the commodity lies around 458 to 460. 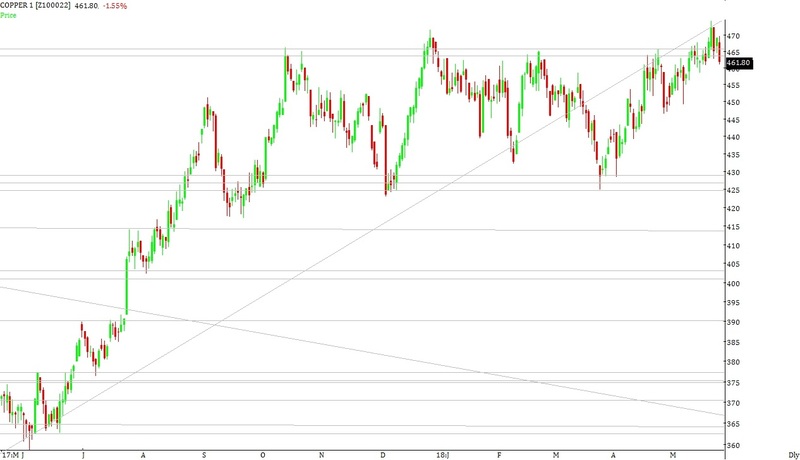 Support for the commodity lies in the zone of 450 to 455 where Fibonacci levels are lying. If the commodity manages to close below these levels then the commodity can drift to the levels of 440 to 445 where Fibonacci levels and short term moving averages are lying. During the week the commodity manages to hit a low of 459 and close the week around the levels of 463. 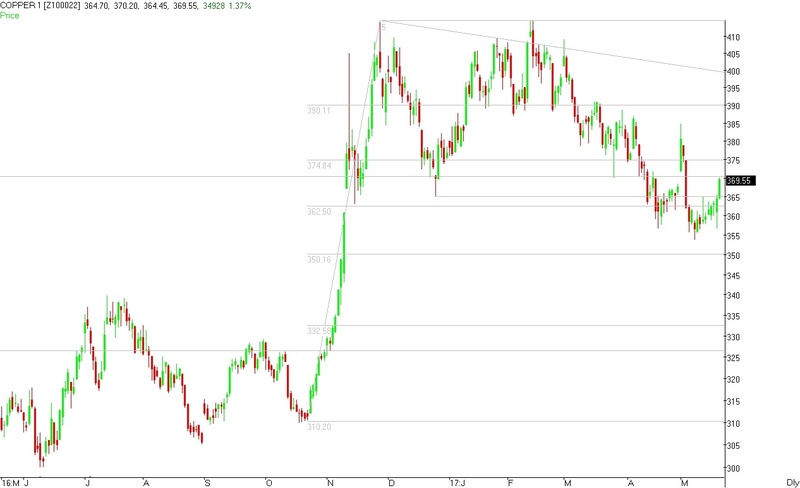 Minor support for the commodity lies around 458 to 460. 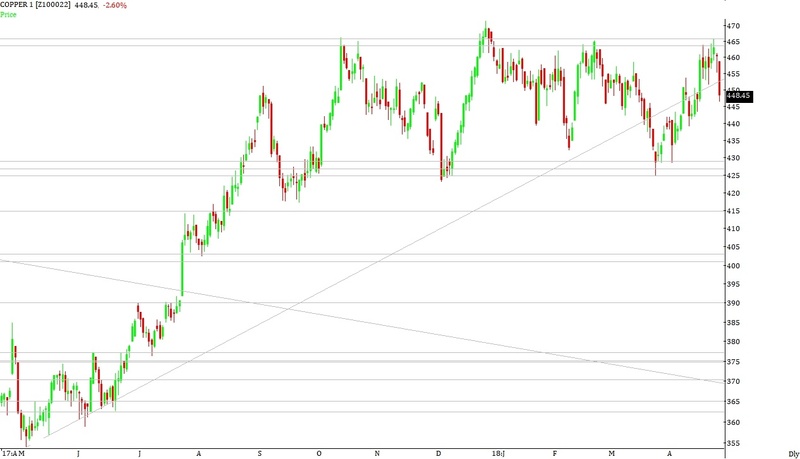 Support for the commodity lies in the zone of 450 to 455 where Fibonacci levels are lying. If the commodity manages to close below these levels then the commodity can drift to the levels of 440 to 445 where Fibonacci levels and short term moving averages are lying. Resistance for the commodity lies in the zone of 465 to 470 where Fibonacci levels and high for the month of October-2018 are lying. If the commodity manages to close above these levels then the commodity can move to the levels of 475 to 480. Broad range for the commodity in the coming week can be seen between 445 – 450 on downside & 475 – 480 on upside. COPPER closed the week on positive note gaining around 4.60%. As we have mentioned last week, that resistance for the commodity lies in the zone of 448 to 452 where Fibonacci levels are lying. If the commodity manages to close above these levels then the commodity can move to the levels of 455 to 460 where Fibonacci levels are lying. During the week the commodity manages to hit a high of 463 and close the week around the levels of 462. COPPER closed the week on negative note losing around 0.20%. As we have mentioned last week, that minor support for the commodity lies around 438 to 440. Support for the commodity lies in the zone of 430 to 435 where Fibonacci levels and medium & long term moving averages are lying. If the commodity manages to close below these levels then the commodity can drift to the levels of 420 to 425 where Fibonacci levels are lying. During the week the commodity manages to hit a low of 431 and close the week around the levels of 442. Minor support for the commodity lies around 438 to 440. Support for the commodity lies in the zone of 430 to 435 where Fibonacci levels and medium & long term moving averages are lying. If the commodity manages to close below these levels then the commodity can drift to the levels of 420 to 425 where Fibonacci levels are lying. 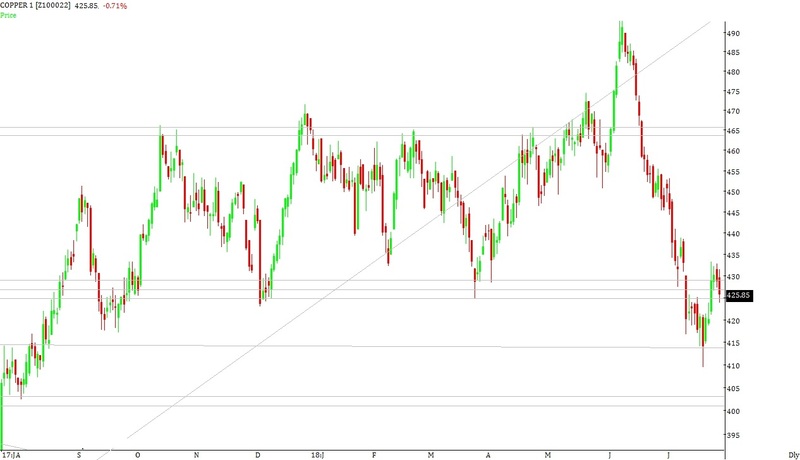 Resistance for the commodity lies in the zone of 448 to 452 where Fibonacci levels are lying. If the commodity manages to close above these levels then the commodity can move to the levels of 455 to 460 where Fibonacci levels are lying. COPPER closed the week on positive note gaining around 0.90%. As we have mentioned last week, that resistance for the commodity lies in the zone of 435 to 440 where Fibonacci levels are lying. If the commodity manages to close above these levels then the commodity can move to the levels of 448 to 452 where Fibonacci levels are lying. During the week the commodity manages to hit a high of 451 and close the week around the levels of 442. COPPER closed the week on positive note gaining around 2.40%. As we have mentioned last week, that resistance for the commodity lies in the zone of 425 to 430 where Fibonacci levels and medium term moving averages are lying. If the commodity manages to close above these levels then the commodity can move to the levels of 435 to 440 where Fibonacci levels and long term moving averages are lying. During the week the commodity manages to hit a high of 440 and close the week around the levels of 439. Support for the commodity lies in the zone of 425 to 430 where Fibonacci levels and medium & long term moving averages are lying. If the commodity manages to close below these levels then the commodity can drift to the levels of 415 to 420 where Fibonacci levels are lying. Resistance for the commodity lies in the zone of 435 to 440 where Fibonacci levels are lying. If the commodity manages to close above these levels then the commodity can move to the levels of 448 to 452 where Fibonacci levels are lying. Broad range for the commodity in the coming week can be seen between 425 – 430 on downside & 450 – 455 on upside. As we have mentioned last week, that support for the commodity lies in the zone of 415 to 420 where Fibonacci levels are lying. If the commodity manages to close below these levels then the commodity can drift to the levels of 400 to 405 where long term Fibonacci level is lying. During the week the commodity manages to hit a low of 414 and close the week around the levels of 429. 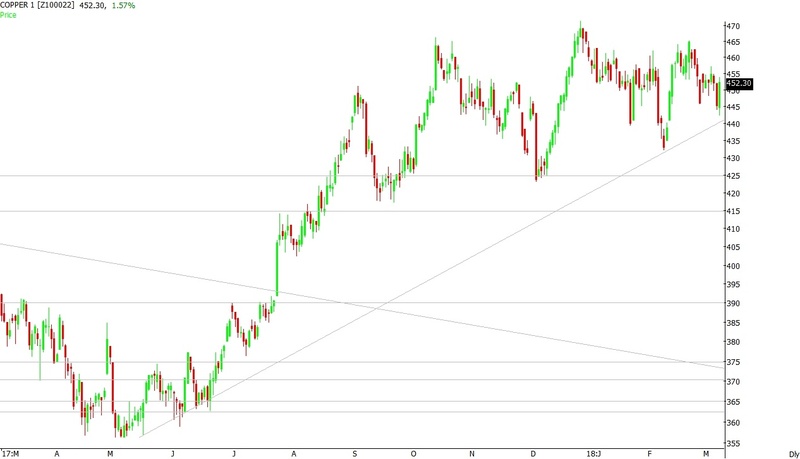 Support for the commodity lies in the zone of 415 to 420 where Fibonacci levels are lying. If the commodity manages to close below these levels then the commodity can drift to the levels of 400 to 405 where long term Fibonacci level is lying. Resistance for the commodity lies in the zone of 425 to 430 where Fibonacci levels and medium term moving averages are lying. If the commodity manages to close above these levels then the commodity can move to the levels of 435 to 440 where Fibonacci levels and long term moving averages are lying. Broad range for the commodity in the coming week can be seen between 410 – 415 on downside & 440 – 445 on upside. COPPER closed the week on positive note gaining around 3.20%. As we have mentioned last week, that resistance for the commodity lies in the zone of 415 to 420 where Fibonacci levels are lying. If the commodity manages to close above these levels then the commodity can move to the levels of 425 to 430 where Fibonacci levels and short term moving averages are lying. During the week the commodity manages to hit a high of 431 and close the week around the levels of 429. As we have mentioned last week, that support for the commodity lies in the zone of 410 to 415 where low for the month of Sepetmber-2018 is lying. If the commodity manages to close below these levels then the commodity can drift to the levels of 400 to 405 where long term Fibonacci levels and low for the month of August-2018 is lying. During the week the commodity manages to hit a low of 412 and close the week around the levels of 417. Support for the commodity lies in the zone of 410 to 415 where low for the month of Sepetmber-2018 is lying. If the commodity manages to close below these levels then the commodity can drift to the levels of 400 to 405 where long term Fibonacci levels and low for the month of August-2018 is lying. Resistance for the commodity lies in the zone of 425 to 430 from where the commodity broke down from November-2018 low and Fibonacci levels are lying. If the commodity manages to close above these levels then the commodity can move to the levels of 435 to 440 where short; medium & long term moving averages and Fibonacci levels are lying. Broad range for the commodity in the coming week can be seen between 400 – 405 on downside & 430 – 435 on upside. COPPER closed the week on negative note losing around 5.50%. As we have mentioned last week, that support for the commodity lies in the zone of 435 to 440 where short; medium & long term moving averages and Fibonacci levels are lying. 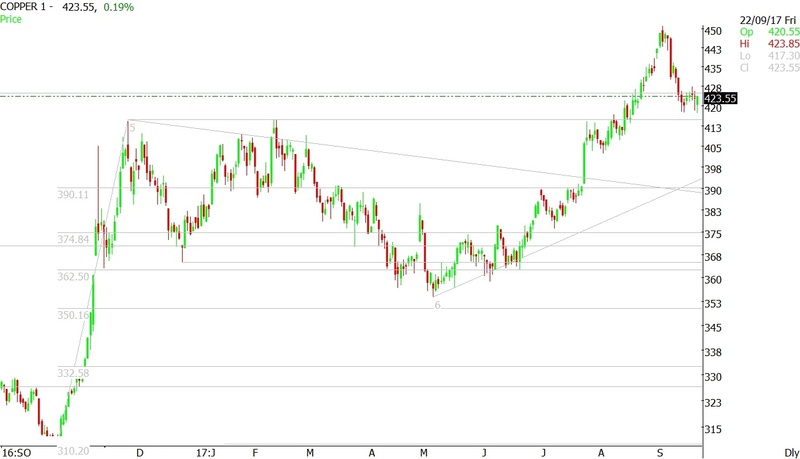 If the commodity manages to close below these levels then the commodity can drift to the levels of 425 to 430 from where the commodity broke out of August-2018 high and Fibonacci levels are lying. During the week the commodity manages to hit a low of 416 and close the week around the levels of 418. As we have mentioned last week, that resistance for the commodity lies in the zone of 445 to 450 where short; medium & long term moving averages and Fibonacci levels are lying. If the commodity manages to close above these levels then the commodity can move to the levels of 455 to 460 where Fibonacci levels are lying. During the week the commodity manages to hit a high of 448 and close the week around the levels of 441. Support for the commodity lies in the zone of 435 to 440 where short; medium & long term moving averages and Fibonacci levels are lying. 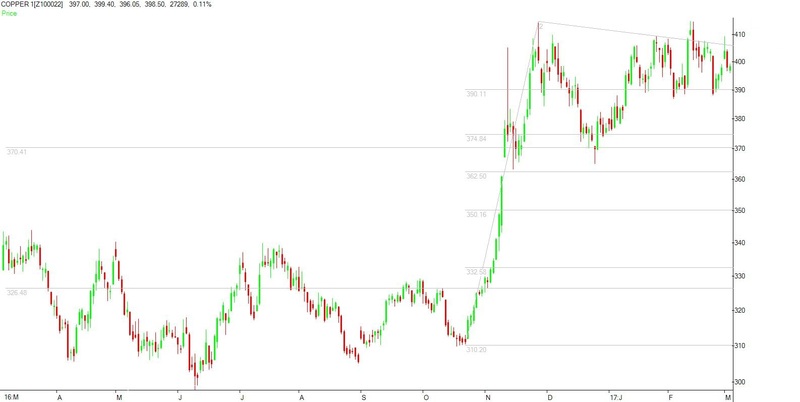 If the commodity manages to close below these levels then the commodity can drift to the levels of 425 to 430 from where the commodity broke out of August-2018 high and Fibonacci levels are lying. 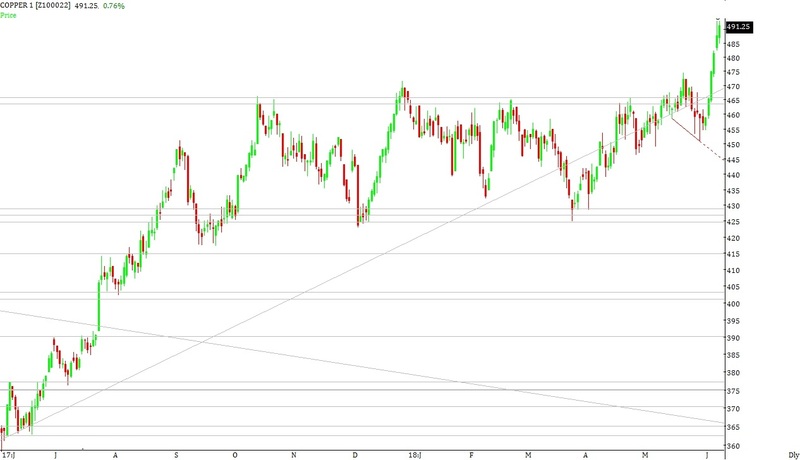 Resistance for the commodity lies in the zone of 450 to 455 where Fibonacci levels are lying. If the commodity manages to close above these levels then the commodity can move to the levels of 460 to 465 where Fibonacci levels are lying. COPPER closed the week on negative note losing around 4.40%. As we have mentioned last week, that support for the commodity lies in the zone of 440 to 445 where Fibonacci levels and short & long term moving averages are lying. 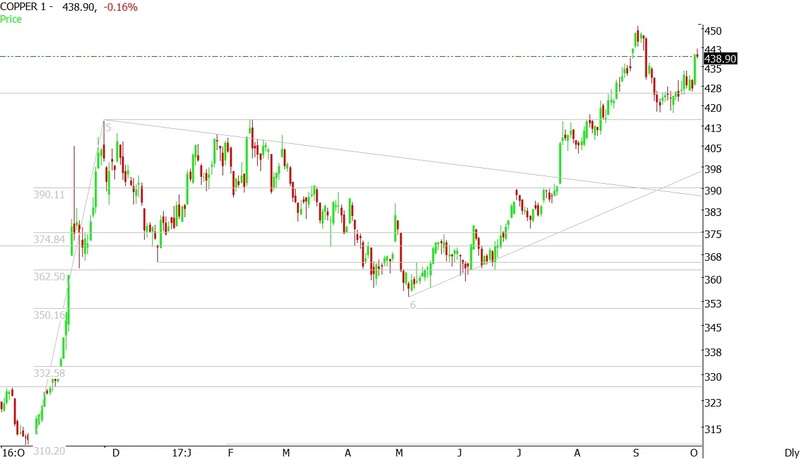 If the commodity manages to close below these levels then the commodity can drift to the levels of 430 to 435 from where the commodity broke out of August-2018 high and Fibonacci levels are lying. During the week the commodity manages to hit a low of 430 and close the week around the levels of 431. Resistance for the commodity lies in the zone of 435 to 440 where Fibonacci levels and long term moving averages are lying. If the commodity manages to close above these levels then the commodity can move to the levels of 445 to 450 where Fibonacci levels and short term moving averages are lying. Broad range for the commodity in the coming week can be seen between 410 – 415 on downside & 445 – 450 on upside. COPPER closed the week on negative note losing around 1.80%. As we have mentioned last week, that resistance for the commodity lies in the zone of 460 to 465 where Fibonacci levels are lying. If the commodity manages to close above these levels then the commodity can move to the levels of 475 to 480. During the week the commodity manages to hit a high of 460 and close the week around the levels of 445. Support for the commodity lies in the zone of 440 to 445 where Fibonacci levels and short & long term moving averages are lying. 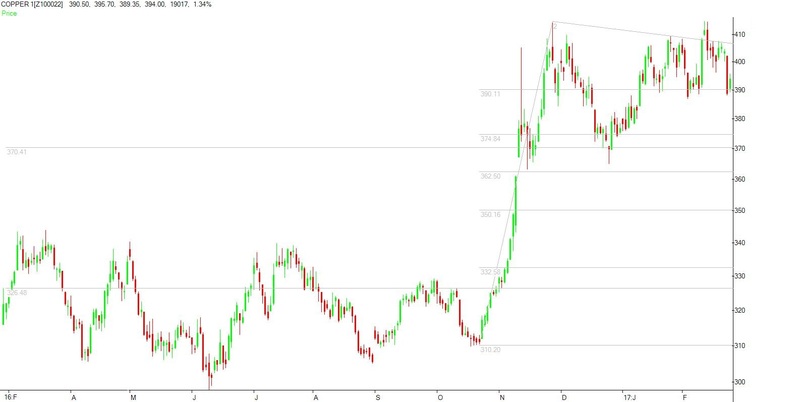 If the commodity manages to close below these levels then the commodity can drift to the levels of 430 to 435 from where the commodity broke out of August-2018 high and Fibonacci levels are lying. Minor resistance for the commodity lies in the zone of 450 to 455. 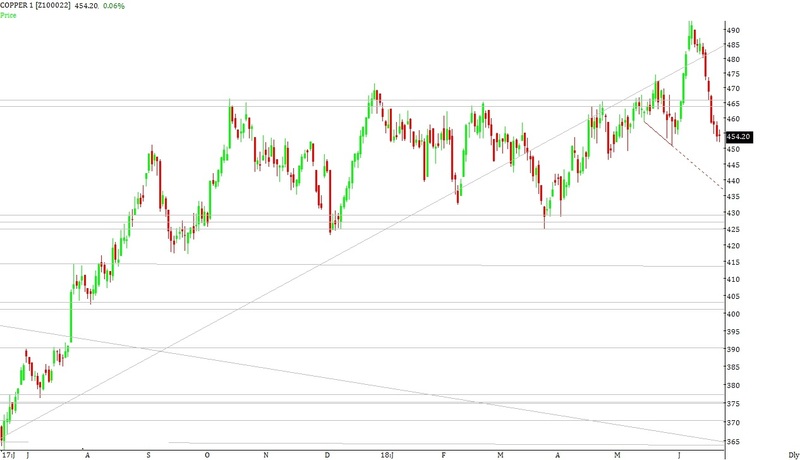 Resistance for the commodity lies in the zone of 460 to 465 where Fibonacci levels are lying. If the commodity manages to close above these levels then the commodity can move to the levels of 475 to 480. Broad range for the commodity in the coming week can be seen between 430 – 435 on downside & 460 – 465 on upside. As we have mentioned last week, that support for the commodity lies in the zone of 445 to 450 where Fibonacci levels are lying. If the commodity manages to close below these levels then the commodity can drift to the levels of 430 to 435 from where the commodity broke out of August-2018 high and short term moving averages are lying. During the week the commodity manages to hit a low of 446 and close the week around the levels of 457. Broad range for the commodity in the coming week can be seen between 435 – 440 on downside & 470 – 475 on upside. COPPER closed the week on negative note losing around 1.10%. As we have mentioned last week, that resistance for the commodity lies in the zone of 460 to 465 where Fibonacci levels are lying. If the commodity manages to close above these levels then the commodity can move to the levels of 475 to 480. 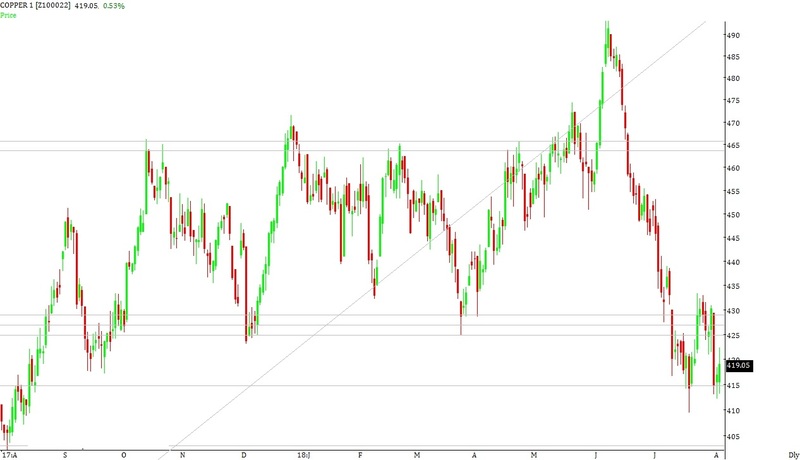 During the week the commodity manages to hit a high of 463 and close the week around the levels of 453. 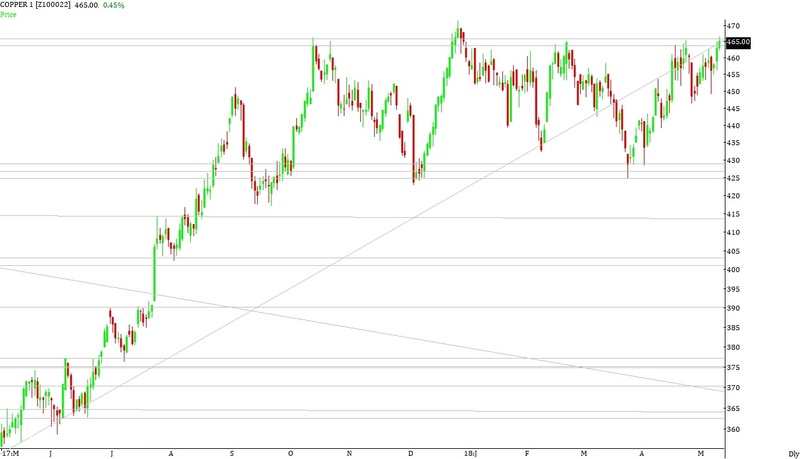 Support for the commodity lies in the zone of 445 to 450 where Fibonacci levels are lying. If the commodity manages to close below these levels then the commodity can drift to the levels of 430 to 435 from where the commodity broke out of August-2018 high and short term moving averages are lying. COPPER closed the week on positive note gaining around 8.10%. As we have mentioned last week, that resistance for the commodity lies in the zone of 430 to 435 from where the commodity broke down from the lows of March-2018 & April-2018, Fibonacci levels and short term moving averages are lying. If the commodity manages to close above these levels then the commodity can move to the levels of 440 to 445 where medium & long term moving averages are lying. During the week the commodity manages to hit a high of 461 and close the week around the levels of 458. Broad range for the commodity in the coming week can be seen between 435 – 440 on downside & 475 – 480 on upside. COPPER closed the week on positive note gaining around 0.30%. As we have mentioned last week, that resistance for the commodity lies in the zone of 430 to 435 from where the commodity broke down from the lows of March-2018 & April-2018, Fibonacci levels and short term moving averages are lying. If the commodity manages to close above these levels then the commodity can move to the levels of 440 to 445 where medium & long term moving averages are lying. During the week the commodity manages to hit a high of 434 and close the week around the levels of 424. As we have mentioned last week, that resistance for the commodity lies in the zone of 430 to 435 from where the commodity broke down from the lows of March-2018 & April-2018, Fibonacci levels and short term moving averages are lying. If the commodity manages to close above these levels then the commodity can move to the levels of 440 to 445 where medium & long term moving averages are lying. During the week the commodity manages to hit a high of 429 and close the week around the levels of 423. COPPER closed the week on positive note gaining around 2.00%. As we have mentioned last week, that support for the commodity lies in the zone of 400 to 405 where the commodity has taken support in the month of August-2017. If the commodity manages to close below these levels then the commodity can drift to the levels of 390 to 395 where long term Fibonacci levels are lying. During the week the commodity manages to hit a low of 405 and close the week around the levels of 416. Resistance for the commodity lies in the zone of 415 to 420 where Fibonacci levels are lying. If the commodity manages to close above these levels then the commodity can move to the levels of 425 to 430 from where the commodity broke down from the lows of March-2018 & April-2018, Fibonacci levels and short term moving averages are lying. Broad range for the commodity in the coming week can be seen between 400 – 405 on downside & 425 – 430 on upside. COPPER closed the week on negative note losing around 1.60%. As we have mentioned last week, that support for the commodity lies in the zone of 415 to 418 where the commodity has taken multiple support in the month of September-2017. If the commodity manages to close below these levels then the commodity can witness a major break down and it can drift to the levels of 400 to 405. During the week the commodity manages to hit a low of 412 and close the week around the levels of 419. COPPER closed the week on positive note gaining around 1.30%. As we have mentioned last week, that resistance for the commodity lies in the zone of 425 to 430 from where the commodity broke down from the lows of March-2018 & April-2018 and Fibonacci levels are lying. If the commodity manages to close above these levels then the commodity can move to the levels of 445 to 450 where short; medium and long term moving averages are lying. During the week the commodity manages to hit a high of 433 and close the week around the levels of 426. Broad range for the commodity in the coming week can be seen between 405 – 410 on downside & 440 – 445 on upside. COPPER closed the week on negative note losing around 0.60%. As we have mentioned last week, that resistance for the commodity lies in the zone of 425 to 430 from where the commodity broke down from the lows of March-2018 & April-2018 and Fibonacci levels are lying. If the commodity manages to close above these levels then the commodity can move to the levels of 445 to 450 where short; medium and long term moving averages are lying. During the week the commodity manages to hit a high of 425 and close the week around the levels of 420. Broad range for the commodity in the coming week can be seen between 400 – 405 on downside & 445 – 450 on upside. COPPER closed the week on negative note losing around 2.10%. As we have mentioned last week, that support for the commodity lies in the zone of 425 to 430 where low for the month of March-2018 & April-2018 and Fibonacci levels are lying. If the commodity manages to close below these levels then the commodity can drift to the levels of 415 to 420 where the commodity has taken multiple support in the month of September-2017. During the week the commodity manages to hit a low of 417 and close the week around the levels of 423. Support for the commodity lies in the zone of 415 to 420 where the commodity has taken multiple support in the month of September-2017. If the commodity manages to close below these levels then the commodity can witness a major break down and it can drift to the levels of 400 to 405. COPPER closed the week on negative note losing around 0.40%. As we have mentioned last week, that support for the commodity lies in the zone of 445 to 450 where low for the month of May-2018 and long term moving averages are lying. If the commodity manages to close below these levels then the commodity can drift to the levels of 425 to 430 where low for the month of March-2018 & April-2018 and Fibonacci levels are lying. During the week the commodity manages to hit a low of 428 and close the week around the levels of 432. Support for the commodity lies in the zone of 425 to 430 where low for the month of March-2018 & April-2018 and Fibonacci levels are lying. If the commodity manages to close below these levels then the commodity can drift to the levels of 415 to 420 where the commodity has taken multiple support in the month of September-2017. 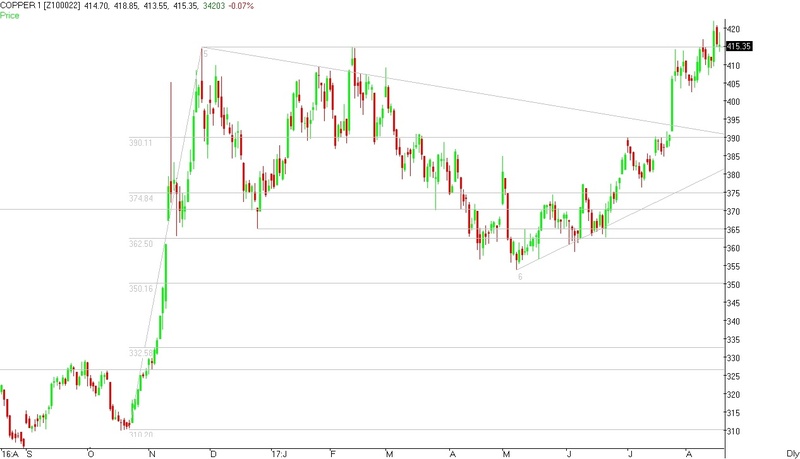 Minor resistance lies in the zone of 435 to 438. Resistance for the commodity lies in the zone of 445 to 450 from where the commodity broke down from the lows of May-2018 & June-2018 and long term moving averages are lying. If the commodity manages to close above these levels then the commodity can move to the levels of 460 to 465 where medium term moving averages and Fibonacci levels are lying. As we have mentioned last week, that support for the commodity lies in the zone of 445 to 450 where low for the month of May-2018 and long term moving averages are lying. If the commodity manages to close below these levels then the commodity can drift to the levels of 425 to 430 where low for the month of March-2018 & April-2018 and Fibonacci levels are lying. During the week the commodity manages to hit a low of 452 and close the week around the levels of 453. Broad range for the commodity in the coming week can be seen between 435 – 440 on downside & 465 – 470 on upside. COPPER closed the week on negative note losing around 3.50%. As we have mentioned last week, that support for the commodity lies in the zone of 480 to 485 where break out levels are lying. 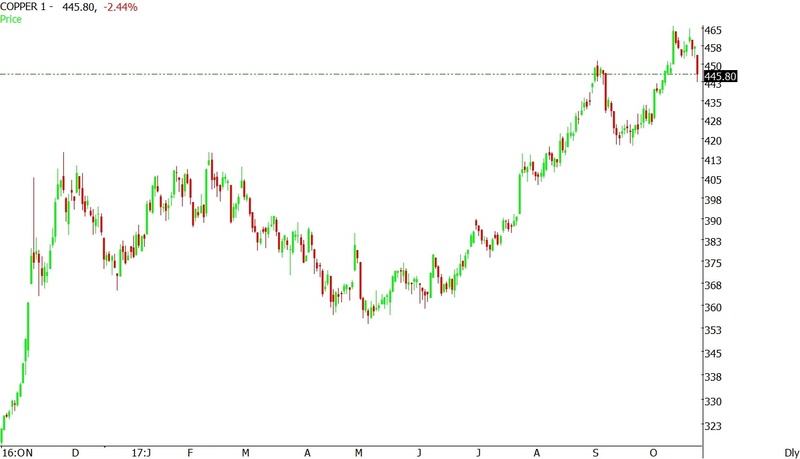 If the commodity manages to close below these levels then the commodity can drift to the levels of 470 to 475 from where the commodity broke out of double top pattern. During the week the commodity manages to hit a low of 473 and close the week around the levels of 474. Support for the commodity lies in the zone of 465 to 470 from where the commodity broke out of December-2017, February-2018 and April-2018 highs. If the commodity manages to close below these levels then the commodity can drift to the levels of 455 to 460 where short and medium term moving averages are lying. Resistance for the commodity lies in the zone of 480 to 485 from where the commodity has broken down after consolidation. 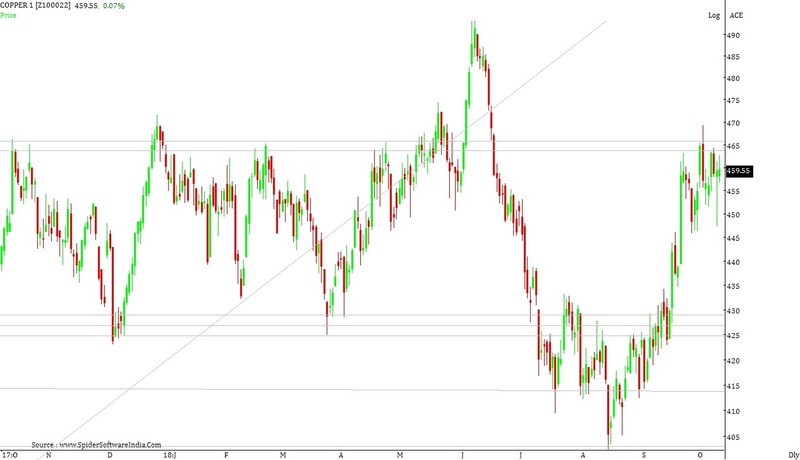 If the commodity manages to close above these levels then the commodity can move to the levels of 495 to 500 where the commodity has formed a short term top. Broad range for the commodity in the coming week can be seen between 460 – 465 on downside & 490 – 495 on upside. As we have mentioned last week, that minor support for the commodity lies in the zone of 457 to 459. Support for the commodity lies in the zone of 448 to 452 where short & medium term moving averages are lying. If the commodity manages to close below these levels then the commodity can drift to the levels of 438 to 442 where break out levels and long term moving averages are lying. During the week the commodity manages to hit a low of 451 and close the week around the levels of 459. Support for the commodity lies in the zone of 448 to 452 where short & medium term moving averages are lying. If the commodity manages to close below these levels then the commodity can drift to the levels of 438 to 442 where break out levels and long term moving averages are lying. 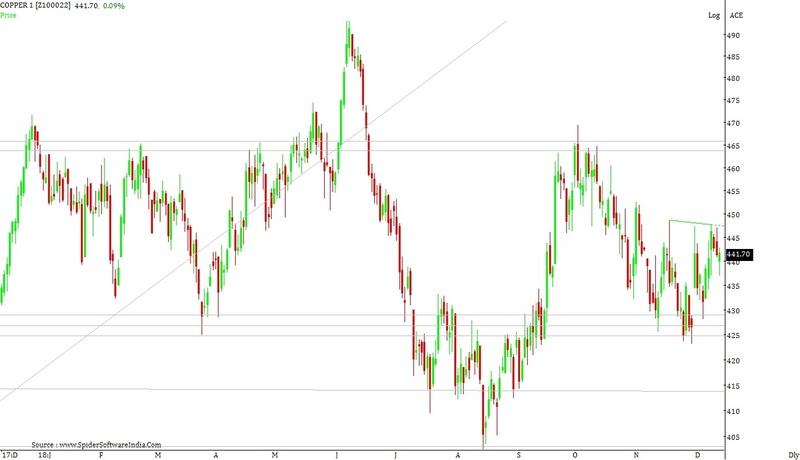 Resistance for the commodity lies in the zone of 463 to 466 from where the commodity has retraced multiple times and Fibonacci levels are lying. 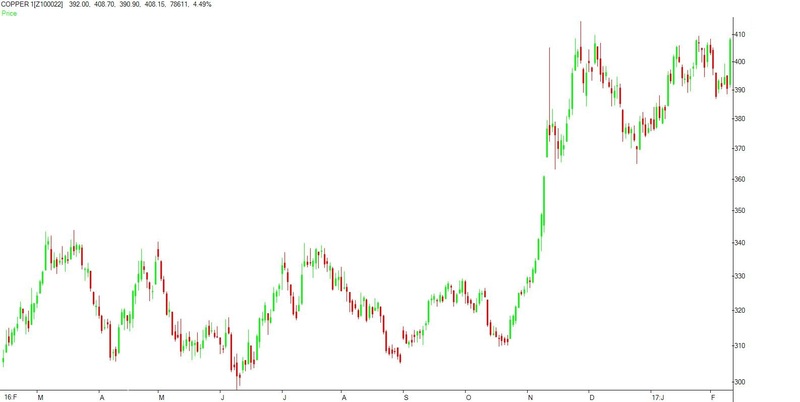 If the commodity manages to close above these levels then the commodity can move to the levels of 470 to 475 where the commodity has formed a high in the month of December-2017. COPPER closed the week on negative note losing around 0.10%. 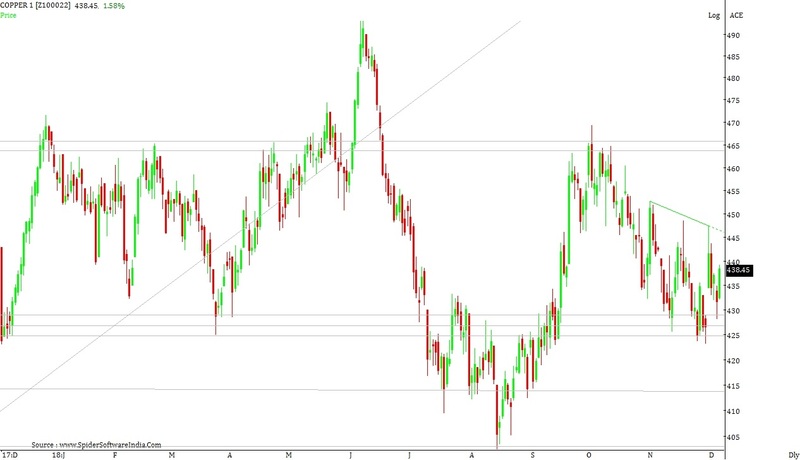 As we have mentioned last week, that resistance for the commodity lies in the zone of 463 to 466 from where the commodity has retraced multiple times and Fibonacci levels are lying. If the commodity manages to close above these levels then the commodity can move to the levels of 470 to 475 where the commodity has formed a high in the month of December-2017. During the week the commodity manages to hit a high of 475 and close the week around the levels of 462. Minor support for the commodity lies in the zone of 457 to 459. Support for the commodity lies in the zone of 448 to 452 where short & medium term moving averages are lying. If the commodity manages to close below these levels then the commodity can drift to the levels of 438 to 442 where break out levels and long term moving averages are lying. COPPER closed the week on positive note gaining around 1.60%. As we have mentioned last week, that support for the commodity lies in the zone of 448 to 452 where short & medium term moving averages are lying. If the commodity manages to close below these levels then the commodity can drift to the levels of 438 to 442 where break out levels and long term moving averages are lying. During the week the commodity manages to hit a low of 449 and close the week around the levels of 465. As we have mentioned last week, that resistance for the commodity lies in the zone of 460 to 465 from where the commodity has retraced multiple times. If the commodity manages to close above these levels then the commodity can move to the levels of 470 to 475 where the commodity has formed a high in the month of December-2017. During the week the commodity manages to hit a high of 461 and close the week around the levels of 457. 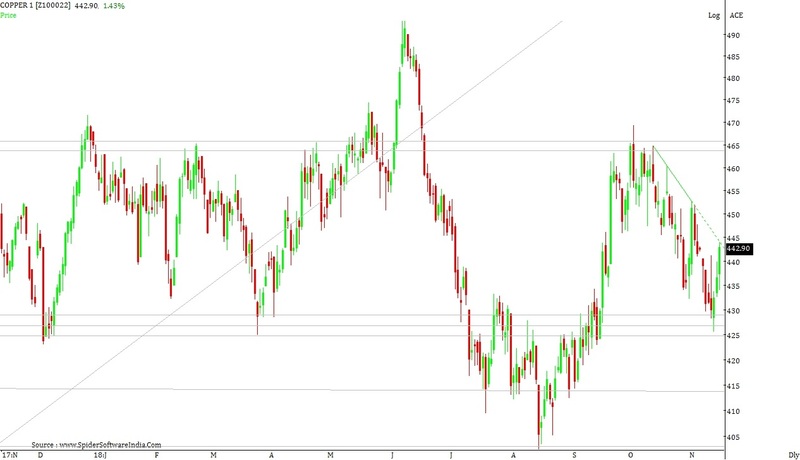 Resistance for the commodity lies in the zone of 460 to 465 from where the commodity has retraced multiple times. If the commodity manages to close above these levels then the commodity can move to the levels of 470 to 475 where the commodity has formed a high in the month of December-2017. COPPER closed the week on negative note losing around 2.20%. As we have mentioned last week, that resistance for the commodity lies in the zone of 460 to 465 from where the commodity has retraced multiple times. If the commodity manages to close above these levels then the commodity can move to the levels of 470 to 475 where the commodity has formed a high in the month of December-2017. During the week the commodity manages to hit a high of 466 and close the week around the 449. COPPER closed the week on positive note gaining around 3.60%. As we have mentioned last week, that resistance for the commodity lies in the zone of 450 to 455 where short & medium term moving averages are lying. 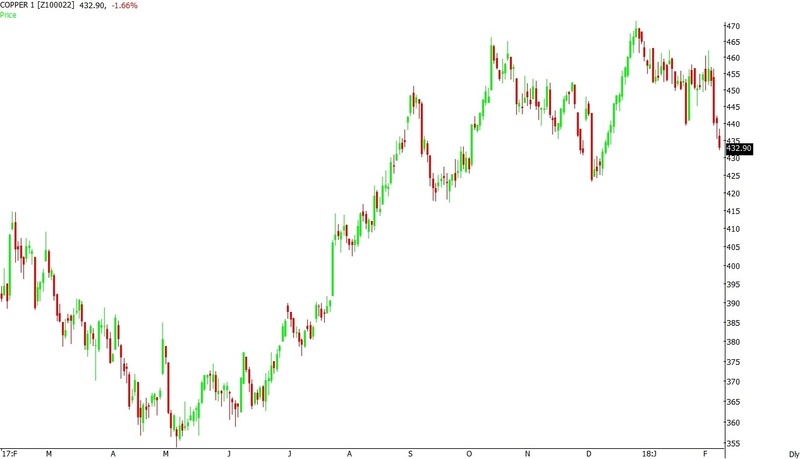 If the commodity manages to close above these levels then the commodity can move to the levels of 460 to 465 from where the commodity has retraced multiple times. During the week the commodity manages to hit a high of 464 and close the week around the levels of 459. Support for the commodity lies in the zone of 450 to 455 where short & medium term moving averages are lying. If the commodity manages to close below these levels then the commodity can drift to the levels of 438 to 442 where break out levels and long term moving averages are lying. Broad range for the commodity in the coming week can be seen between 440 – 445 on downside & 475 – 480 on upside. As we have mentioned last week, that support for the commodity lies in the zone of 425 to 430 where the commodity has formed a bottom in the month of February-2018 and Fibonacci levels are lying. 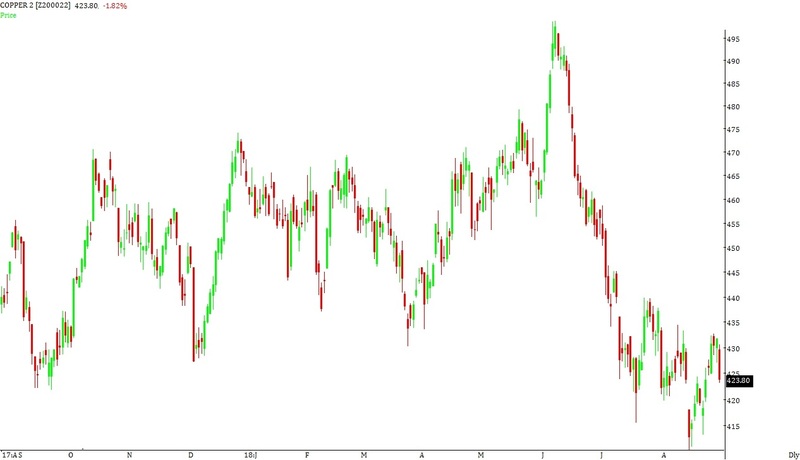 If the commodity manages to close below these levels then the commodity can drift to the levels of 415 to 420 where the commodity has formed a double bottom in the month of September-2017. During the week the commodity manages to hit a low of 429 and close the week around the levels of 438. 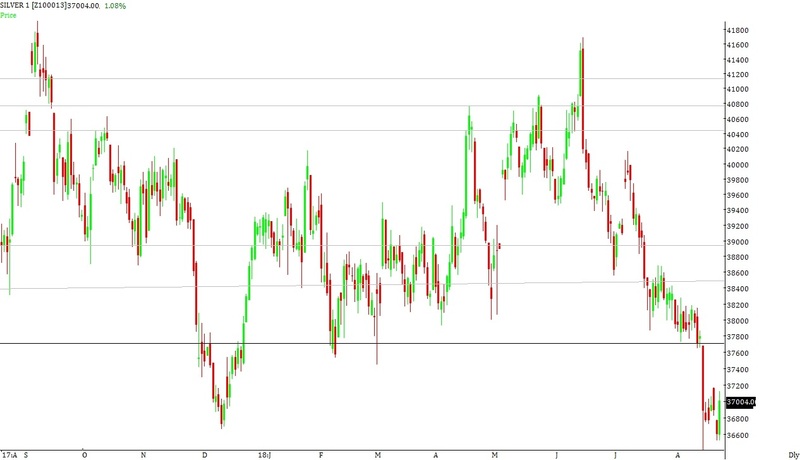 Support for the commodity lies in the zone of 425 to 430 where the commodity has formed a bottom in the month of February-2018 and Fibonacci levels are lying. If the commodity manages to close below these levels then the commodity can drift to the levels of 415 to 420 where the commodity has formed a double bottom in the month of September-2017. Minor resistance for the commodity lies in the zone of 440 to 445. Resistance for the commodity lies in the zone of 450 to 455 where short & medium term moving averages are lying. 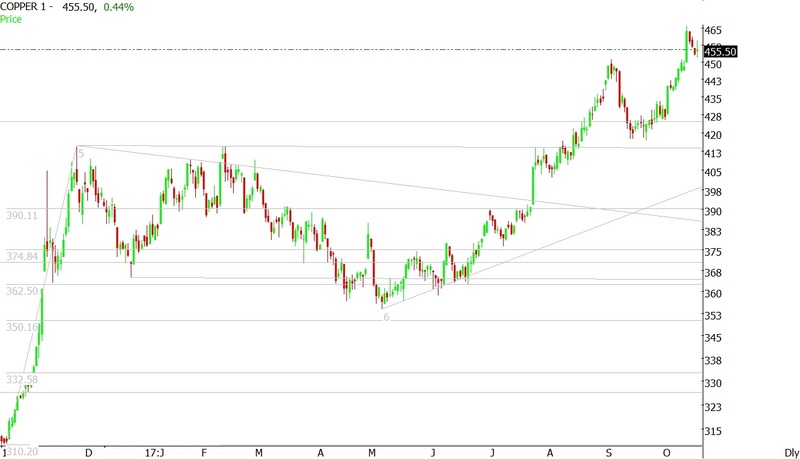 If the commodity manages to close above these levels then the commodity can move to the levels of 460 to 465 from where the commodity has retraced multiple times. Broad range for the commodity in the coming week can be seen between 420 – 425 on downside & 450 – 455 on upside. COPPER closed the week on positive note gaining around 0.80%. As we have mentioned last week, that support for the commodity lies in the zone of 425 to 430 where the commodity has formed a bottom in the month of February-2018 and Fibonacci levels are lying. If the commodity manages to close below these levels then the commodity can drift to the levels of 415 to 420 where the commodity has formed a double bottom in the month of September-2017. During the week the commodity manages to hit a low of 425 and close the week around the levels of 437. Broad range for the commodity in the coming week can be seen between 415 – 420 on downside & 450 – 455 on upside. COPPER closed the week on negative note losing around 3.40%. As we have mentioned last week, that support for the commodity lies in the zone of 450 to 455 where short & medium term moving averages are lying. 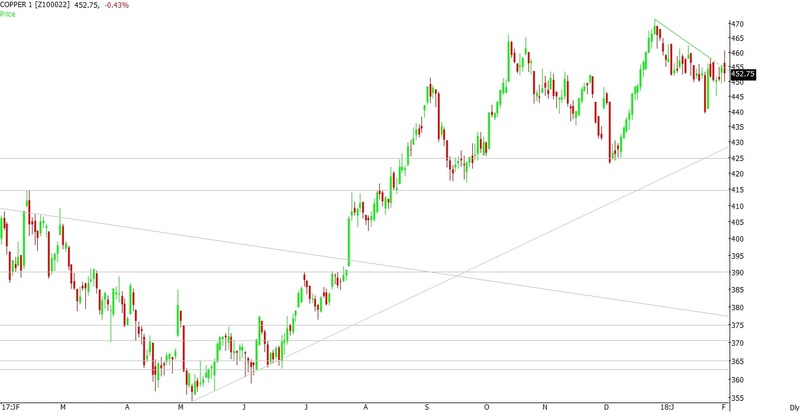 If the commodity manages to close below these levels then the commodity can drift to the levels of 430 to 435 where the commodity has formed a short term bottom in the month of February-2018 and Fibonacci levels are lying. During the week the commodity manages to hit a low of 432 and close the week around the levels of 434. As we have mentioned last week, that support for the commodity lies in the zone of 450 to 455 where short & medium term moving averages are lying. 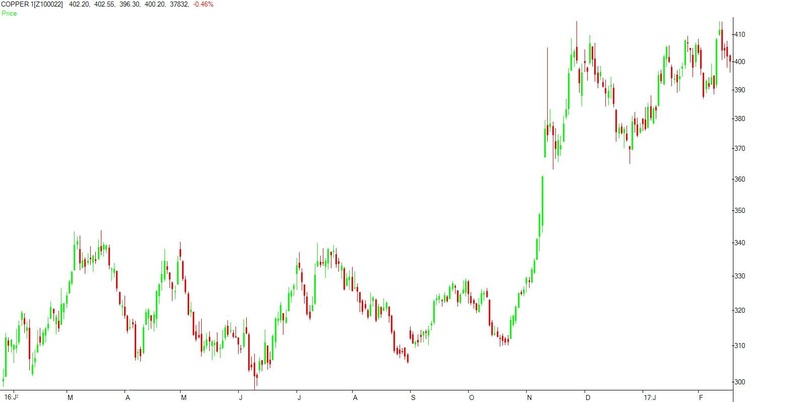 If the commodity manages to close below these levels then the commodity can drift to the levels of 430 to 435 where the commodity has formed a short term bottom. During the week the commodity manages to hit a low of 442 and close the week around the levels of 452. Support for the commodity lies in the zone of 450 to 455 where short & medium term moving averages are lying. 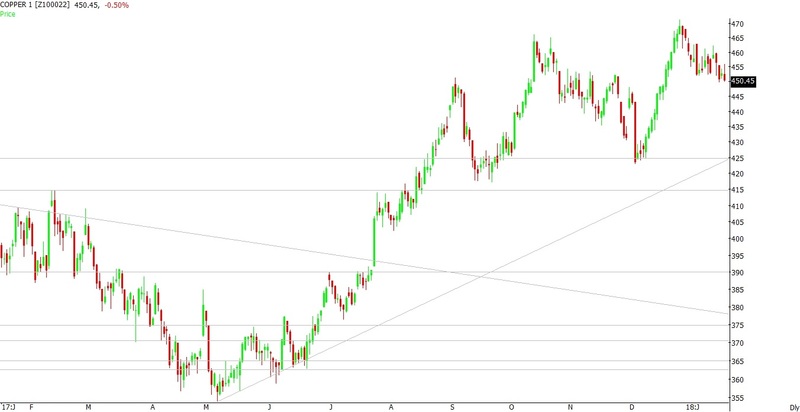 If the commodity manages to close below these levels then the commodity can drift to the levels of 430 to 435 where the commodity has formed a short term bottom in the month of February-2018 and Fibonacci levels are lying. 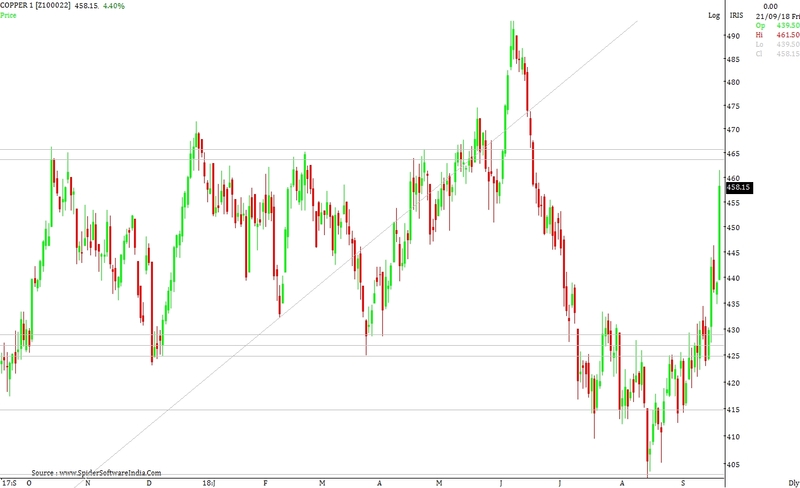 Resistance for the commodity lies in the zone of 460 to 465 from where the commodity has retraced multiple times. If the commodity manages to close above these levels then the commodity can move to the levels of 470 to 475 where the commodity has formed a top in the month of December-2017. COPPER closed the week on negative note losing around 1.50%. As we have mentioned last week, that resistance for the commodity lies in the zone of 460 to 465 from where the commodity has retraced multiple times. If the commodity manages to close above these levels then the commodity can move to the levels of 470 to 475 where the commodity has formed a top in the month of December-2017. During the week the commodity manages to hit a high of 462 and close the week around the levels of 453. Support for the commodity lies in the zone of 450 to 455 where short & medium term moving averages are lying. 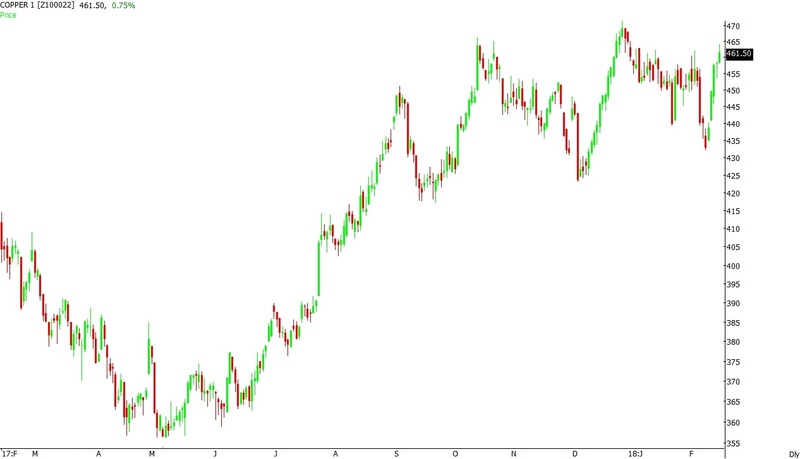 If the commodity manages to close below these levels then the commodity can drift to the levels of 430 to 435 where the commodity has formed a short term bottom. As we have mentioned last week, that resistance for the commodity lies in the zone of 460 to 465 from where the commodity has retraced multiple times. If the commodity manages to close above these levels then the commodity can move to the levels of 470 to 475 where the commodity has formed a top in the month of December-2017. During the week the commodity manages to hit a high of 465 and close the week around the levels of 460. Broad range for the commodity in the coming week can be seen between 440 – 445 on downside & 480 – 485 on upside. COPPER closed the week on positive note gaining around 6.50%. As we have mentioned last week, that minor resistance for the commodity lies in the zone of 435 to 438. Resistance for the commodity lies in the zone of 445 to 450 where short & medium term moving averages are lying. 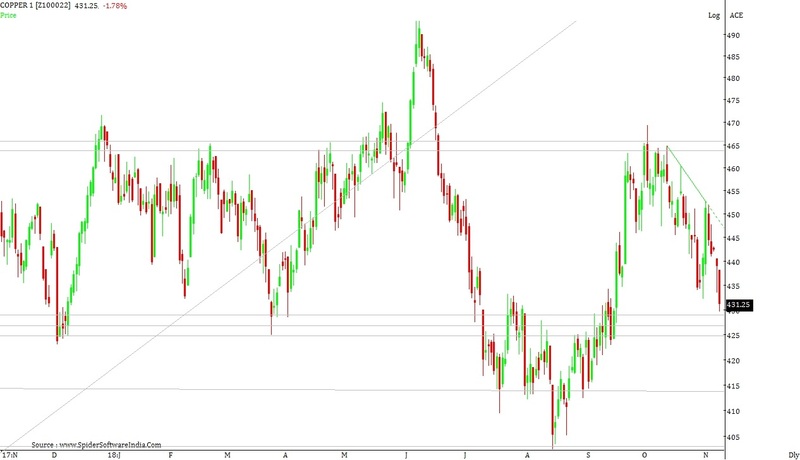 If the commodity manages to close above these levels then the commodity can move to the levels of 460 to 465 from where the commodity has retraced multiple times. During the week the commodity manages to hit a high of 464 and close the week around the levels of 461. Support for the commodity lies in the zone of 445 to 450 where short & medium term moving averages are lying. If the commodity manages to close below these levels then the commodity can drift to the levels of 425 to 430 where Fibonacci levels are lying. As we have mentioned last week, that Support for the commodity lies in the zone of 445 to 448 where short & medium term moving averages are lying. If the commodity manages to close below these levels then the commodity can drift to the levels of 425 to 430 where Fibonacci levels are lying. During the week the commodity manages to hit a low of 432 and close the week around the levels of 432. Support for the commodity lies in the zone of 425 to 430 where Fibonacci levels are lying. If the commodity manages to close below these levels then the commodity can drift to the levels of 415 to 420 where long term moving averages are lying. Minor resistance for the commodity lies in the zone of 435 to 438. Resistance for the commodity lies in the zone of 445 to 450 where short & medium term moving averages are lying. 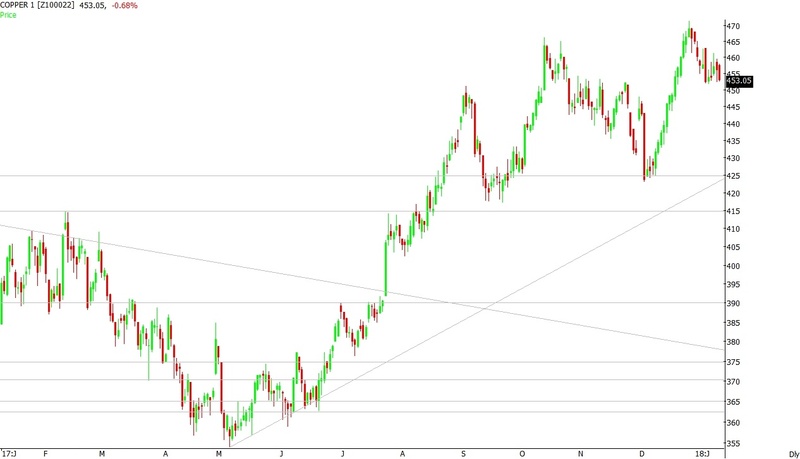 If the commodity manages to close above these levels then the commodity can move to the levels of 460 to 465 from where the commodity has retraced multiple times. COPPER closed the week on positive note gaining around 0.20%. As we have mentioned last week, that support for the commodity lies in the zone of 445 to 448 where short & medium term moving averages are lying. If the commodity manages to close below these levels then the commodity can drift to the levels of 425 to 430 where Fibonacci levels are lying. During the week the commodity manages to hit a low of 445 and close the week around the levels of 453. Support for the commodity lies in the zone of 445 to 448 where short & medium term moving averages are lying. If the commodity manages to close below these levels then the commodity can drift to the levels of 425 to 430 where Fibonacci levels are lying. 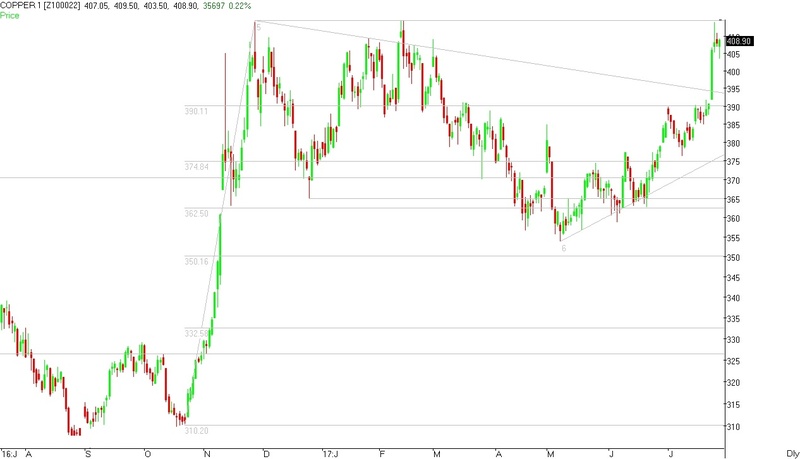 Minor resistance for the commodity lies in the zone of 458 to 462. Resistance for the commodity lies in the zone of 465 to 467 where long term Fibonacci levels are lying. If the commodity manages to close above these levels then the commodity can move to the levels of 475 to 480. 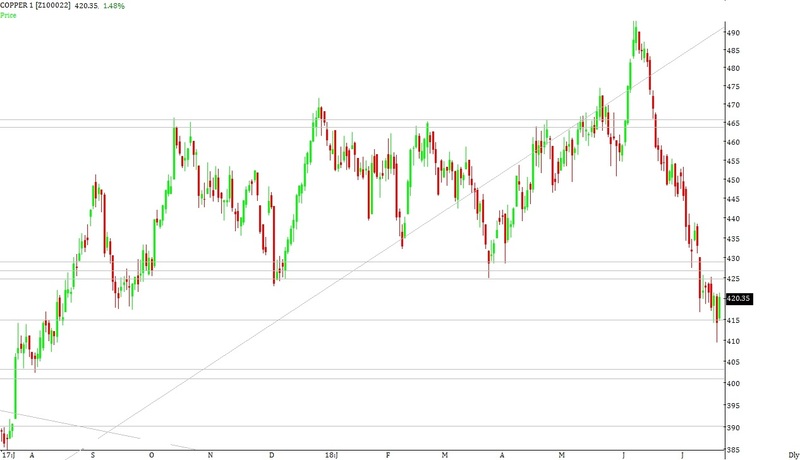 Broad range for the commodity in the coming week can be seen between 430 – 435 on downside & 465 – 470 on upside. 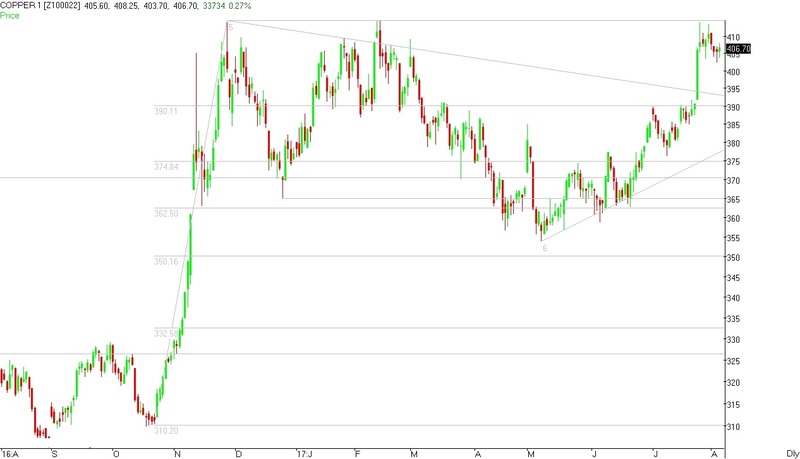 As we have mentioned last week, that minor resistance for the commodity lies in the zone of 458 to 462. Resistance for the commodity lies in the zone of 465 to 467 where long term Fibonacci levels are lying. If the commodity manages to close above these levels then the commodity can move to the levels of 475 to 480. 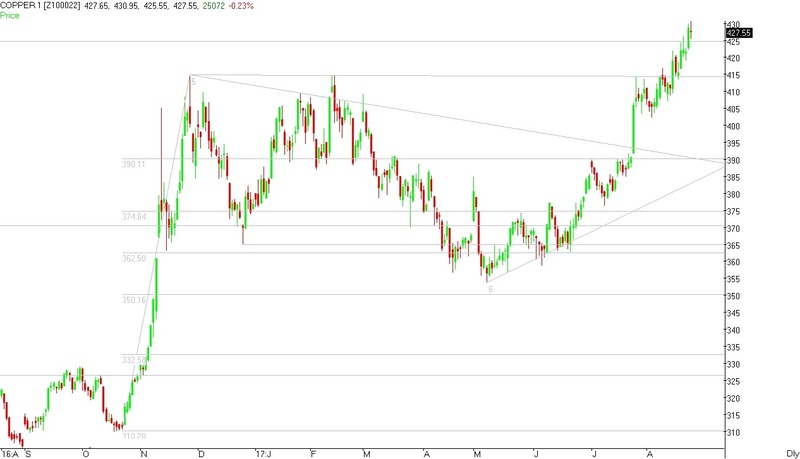 During the week the commodity manages to hit a high of 458 and close the week around the levels of 452. 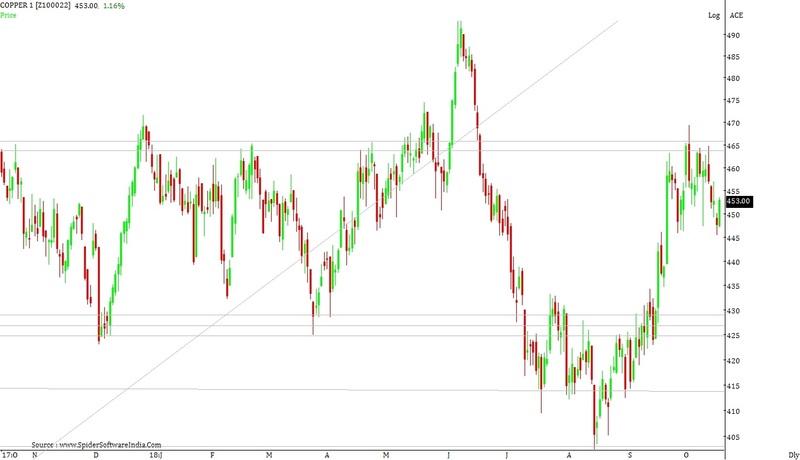 As we have mentioned last week, that minor resistance for the commodity lies in the zone of 458 to 462. Resistance for the commodity lies in the zone of 465 to 467 where long term Fibonacci levels are lying. If the commodity manages to close above these levels then the commodity can move to the levels of 475 to 480. During the week the commodity manages to hit a high of 462 and close the week around the levels of 450. 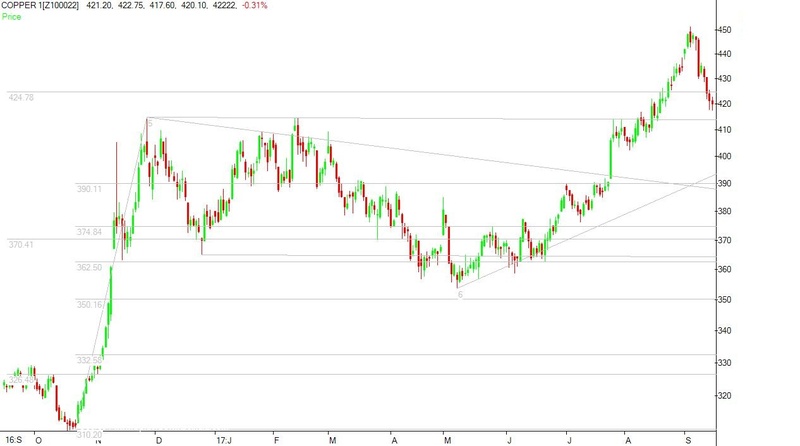 As we have mentioned last week, that minor resistance for the commodity lies in the zone of 458 to 462. Resistance for the commodity lies in the zone of 465 to 467 where long term Fibonacci levels are lying. If the commodity manages to close above these levels then the commodity can move to the levels of 475 to 480. During the week the commodity manages to hit a high of 461 and close the week around the levels of 453. Support for the commodity lies in the zone of 442 to 445 where short & medium term moving averages are lying. If the commodity manages to close below these levels then the commodity can drift to the levels of 425 to 430 where Fibonacci levels are lying. As we have mentioned last week, that resistance for the commodity lies in the zone of 465 to 467 where long term Fibonacci levels are lying. If the commodity manages to close above these levels then the commodity can move to the levels of 475 to 480. During the week the commodity manages to hit a high of 468 and close the week around the levels of 453. As we have mentioned last week, that resistance for the commodity lies in the zone of 465 to 467 where the commodity has formed a top in the month of October-2017. If the commodity manages to close above these levels then the commodity can move to the levels of 475 to 480. 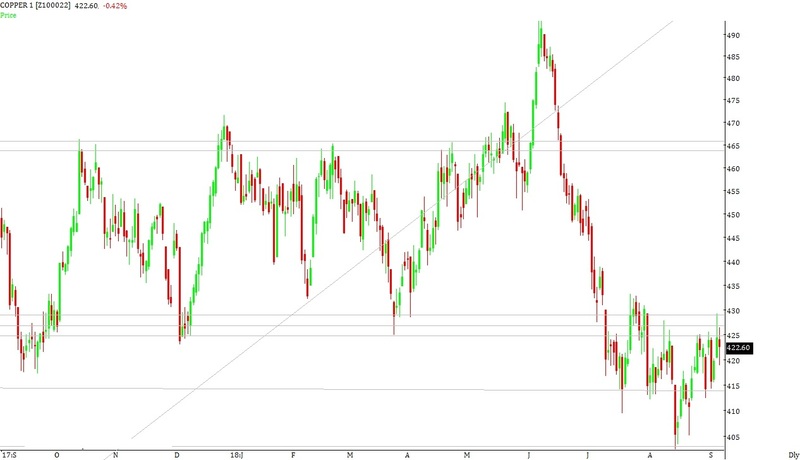 During the week the commodity manages to hit a high of 472 and close the week around the levels of 466. Support for the commodity lies in the zone of 454 to 456 from where the commodity broke out of November-2017 highs. If the commodity manages to close below these levels then the commodity can drift to the levels of 442 to 445 where short term moving averages are lying. Resistance for the commodity lies in the zone of 465 to 467 where long term Fibonacci levels are lying. If the commodity manages to close above these levels then the commodity can move to the levels of 475 to 480. Broad range for the commodity in the coming week can be seen between 450 – 455 on downside & 475 – 480 on upside. As we have mentioned last week, that resistance for the commodity lies in the zone of 450 to 453 where the commodity is facing resistance in the month of Nov-2017. If the commodity manages to close above these levels then the commodity can move to the levels of 465 to 467 where the commodity has formed a top in the month of October-2017. During the week the commodity manages to hit a high of 460 and close the week around the levels of 460. Support for the commodity lies in the zone of 450 to 453 from where the commodity broke out of November-2017 highs. If the commodity manages to close below these levels then the commodity can drift to the levels of 442 to 445 where short term moving averages are lying. Resistance for the commodity lies in the zone of 465 to 467 where the commodity has formed a top in the month of October-2017. 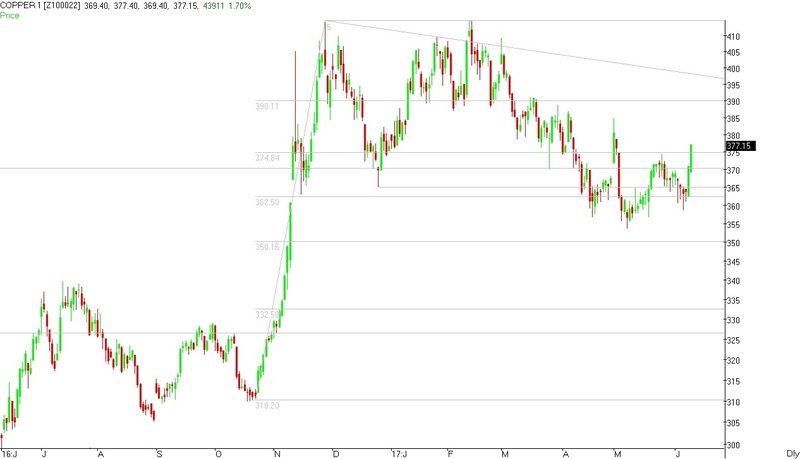 If the commodity manages to close above these levels then the commodity can move to the levels of 475 to 480. COPPER closed the week on positive note gaining around 4.20%. As we have mentioned last week, that support for the commodity lies in the zone of 425 to 427 where long term Fibonacci levels are lying. 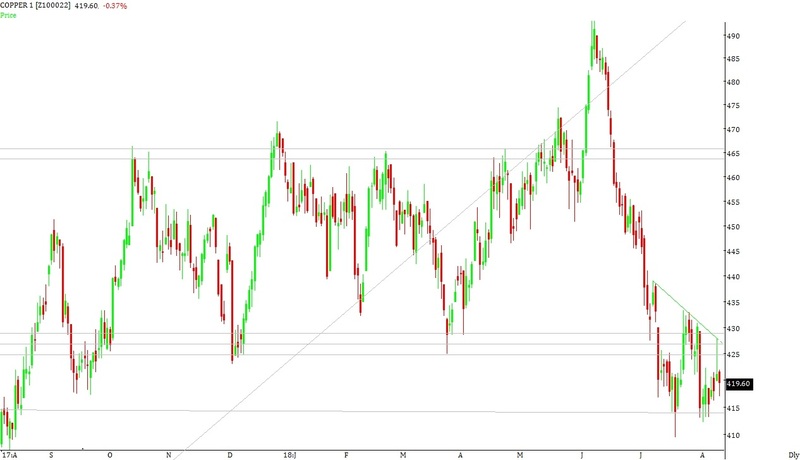 If the commodity manages to close below these levels then the commodity can drift to the levels of 415 to 418 where break out levels and Fibonacci levels are lying. During the week the commodity manages to hit a low of 425 and close the week around the levels of 446. Support for the commodity lies in the zone of 434 to 436 where medium term moving averages are lying. If the commodity manages to close below these levels then the commodity can drift to the levels of 425 to 427 where long term Fibonacci levels are lying. Resistance for the commodity lies in the zone of 450 to 453 where the commodity is facing resistance in the month of Nov-2017. If the commodity manages to close above these levels then the commodity can move to the levels of 465 to 467 where the commodity has formed a top in the month of October-2017. COPPER closed the week on negative note losing around 3.70%. As we have mentioned last week, that support for the commodity lies in the zone of 434 to 436 where break out levels are lying. If the commodity manages to close below these levels then the commodity can drift to the levels of 425 to 427 where long term Fibonacci levels are lying. During the week the commodity manages to hit a low of 423 and close the week around the levels of 428. Support for the commodity lies in the zone of 425 to 427 where long term Fibonacci levels are lying. 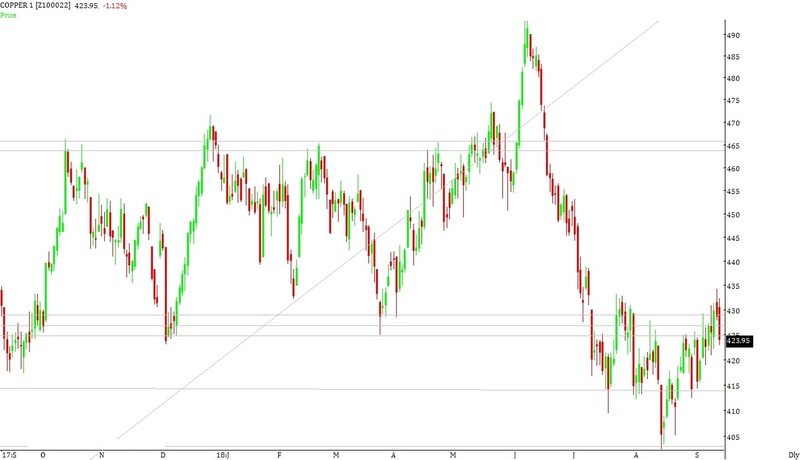 If the commodity manages to close below these levels then the commodity can drift to the levels of 415 to 418 where break out levels and Fibonacci levels are lying. 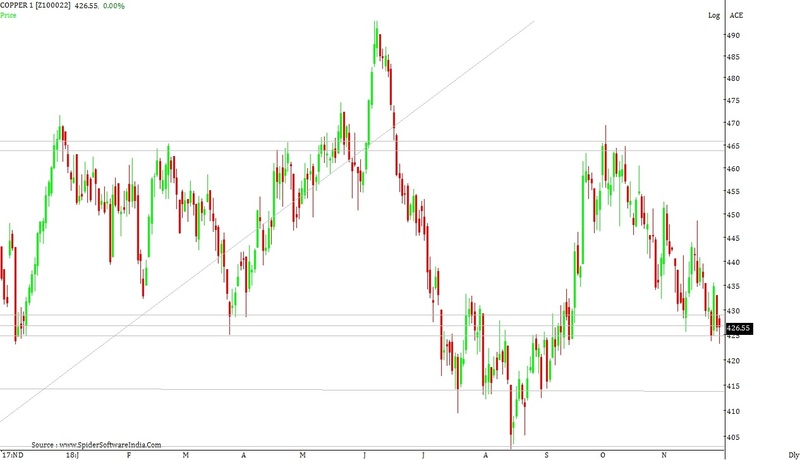 Resistance for the commodity lies in the zone of 434 to 436 where break out levels are lying. If the commodity manages to close above these levels then the commodity can move to the levels of 440 to 443 where short term moving averages are lying. Broad range for the commodity in the coming week can be seen between 415 – 418 on downside & 440 – 443 on upside. COPPER closed the week on negative note losing around 1.70%. As we have mentioned last week, that resistance for the commodity lies in the zone of 451 to 453 from where the commodity has broken down after consolidation. If the commodity manages to close above these levels then the commodity can move to the levels of 464 to 466 where long term Fibonacci levels are lying. During the week the commodity manages to hit a high of 452 and close the week around the levels of 444. Broad range for the commodity in the coming week can be seen between 430 – 433 on downside & 453 – 456 on upside. As we have mentioned last week, that minor resistance for the commodity lies in the zone of 443 to 445. Resistance for the commodity lies in the zone of 451 to 453 from where the commodity has broken down after consolidation. If the commodity manages to close above these levels then the commodity can move to the levels of 464 to 466 where long term Fibonacci levels are lying. During the week the commodity manages to hit a high of 452 and close the week around the levels of 452. Minor support for the commodity lies in the zone of 445 to 447. Support for the commodity lies in the zone of 434 to 436 where break out levels are lying. If the commodity manages to close below these levels then the commodity can drift to the levels of 425 to 427 where long term Fibonacci levels are lying. Broad range for the commodity in the coming week can be seen between 440 – 443 on downside & 463 – 466 on upside. As we have mentioned last week, that resistance for the commodity lies in the zone of 464 to 466 where long term Fibonacci levels are lying. 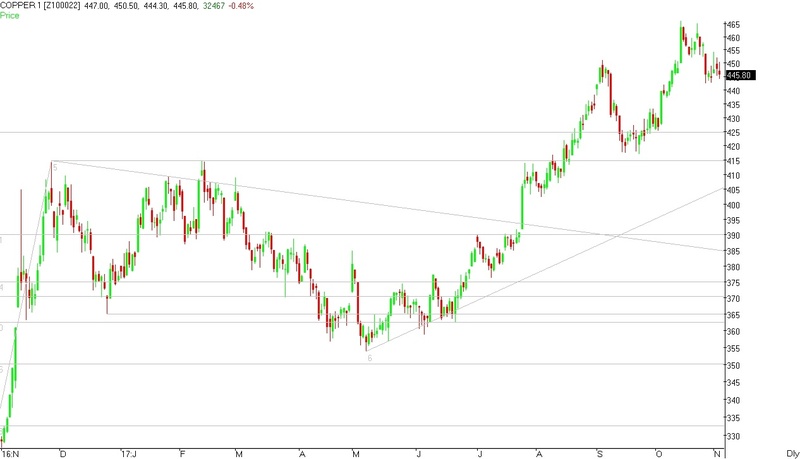 If the commodity manages to close above these levels then the commodity can move to the levels of 472 to 475. During the week the commodity manages to hit a high of 465 and close the week around the levels of 446. COPPER (448.00) closed the week on positive note gaining around 2.00%. As we have mentioned last week, that resistance for the commodity lies in the zone of 442 to 445 from where the commodity has sold off. If the commodity manages to close above these levels then the commodity can move to the levels of 450 to 452 where the commodity has formed a top in the month of September-2017. During the week the commodity manages to hit a high of 451 and close the week around the levels of 448. Minor support for the commodity lies in the zone of 440 to 442. Support for the commodity lies in the zone of 434 to 436 where break out levels are lying. If the commodity manages to close below these levels then the commodity can drift to the levels of 425 to 426 where Fibonacci levels and short term moving averages are lying. Resistance for the commodity lies in the zone of 450 to 452 where the commodity has formed a top in the month of September-2017. If the commodity manages to close above these levels then the commodity can move to the levels of 464 to 466 where long term Fibonacci levels are lying. Broad range for the commodity in the coming week can be seen between 430 – 432 on downside & 460 – 462 on upside. COPPER (427.95) closed the week on positive note gaining around 1.00%. As we have mentioned last week that resistance for the commodity lies in the zone of 425 to 427. If the commodity manages to close above these levels then the commodity can move to the levels of 432 to 435 from where the commodity has broken down. During the week the commodity manages to hit a high of 433 and close the week around the levels of 428. Minor support for the commodity lies in the zone of 424 to 426. Support for the commodity lies in the zone of 414 to 417 where break out levels are lying. If the commodity manages to close below these levels then the commodity can drift to the levels of 400 to 403 where long term Fibonacci levels are lying. Resistance for the commodity lies in the zone of 432 to 435 from where the commodity has broken down. If the commodity manages to close above these levels then the commodity can move to the levels of 442 to 445. Broad range for the commodity in the coming week can be seen between 415 – 418 on downside & 442 – 445 on upside. COPPER (423.55) closed the week on positive note gaining around 0.80%. As we have mentioned last week that support for the commodity lies in the zone of 414 to 417 where short term moving averages and break out levels are lying. If the commodity manages to close below these levels then the commodity can drift to the levels of 400 to 403 where long term Fibonacci levels are lying. During the week the commodity manages to hit a low of 417 and close the week around the levels of 423.55. Support for the commodity lies in the zone of 414 to 417 where short term moving averages and break out levels are lying. If the commodity manages to close below these levels then the commodity can drift to the levels of 400 to 403 where long term Fibonacci levels are lying. Resistance for the commodity lies in the zone of 425 to 427. If the commodity manages to close above these levels then the commodity can move to the levels of 432 to 435 from where the commodity has broken down. Broad range for the commodity in the coming week can be seen between 412 – 415 on downside & 432 – 435 on upside. COPPER (420.10) closed the week on negative note losing around 2.60%. Resistance for the commodity lies in the zone of 424 to 426. If the commodity manages to close above these levels then the commodity can move to the levels of 430 to 432 from where the commodity has broken down. Broad range for the commodity in the coming week can be seen between 408 – 410 on downside & 430 – 433 on upside. COPPER (412.25) closed the week on positive note gaining around 1.40%. As we have mentioned last week, that resistance for the commodity lies in the zone of 412 to 415 where high for the November-2016 and February-2017 is lying. If the commodity manages to close above these levels then the commodity can move to the levels of 422 to 425 where long term Fibonacci levels are lying. During the week the commodity manages to hit a high of 417 and close the week around the levels of 412. Minor support for the commodity lies in the zone of 408 to 410. Support for the commodity lies in the zone of 400 to 403 where the stock has taken multiple support. If the commodity manages to close below these levels then the commodity can drift to the levels of 395 to 397 where trend-line support for the commodity is lying. Broad range for the commodity in the coming week can be seen between 395 – 398 on downside & 422 – 425 on upside. COPPER (408.90) closed the week on positive note gaining around 5.10%. As we have mentioned last week, that resistance for the commodity lies in the zone of 390 to 391 where Fibonacci levels are lying. 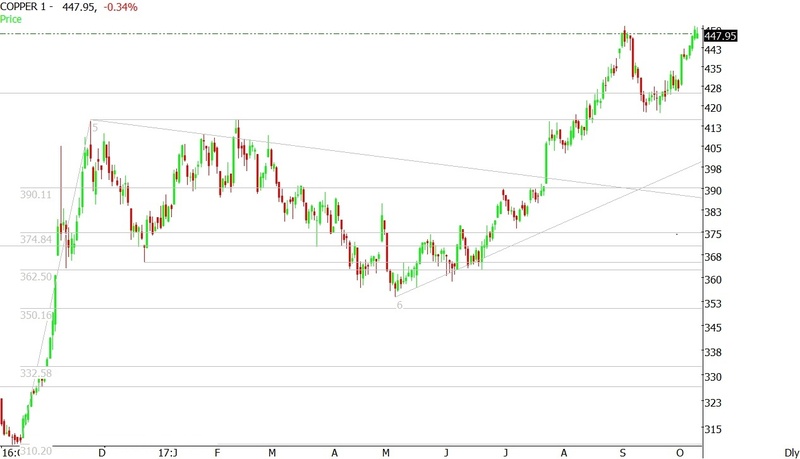 If the commodity manages to close above these levels then the commodity can move to the levels of 395 to 397 where trend-line resistance for the commodity is lying. During the week the commodity manages to hit a high of 414 and close the week around the levels of 409. COPPER (383.65) closed the week on positive note gaining around 0.90%. 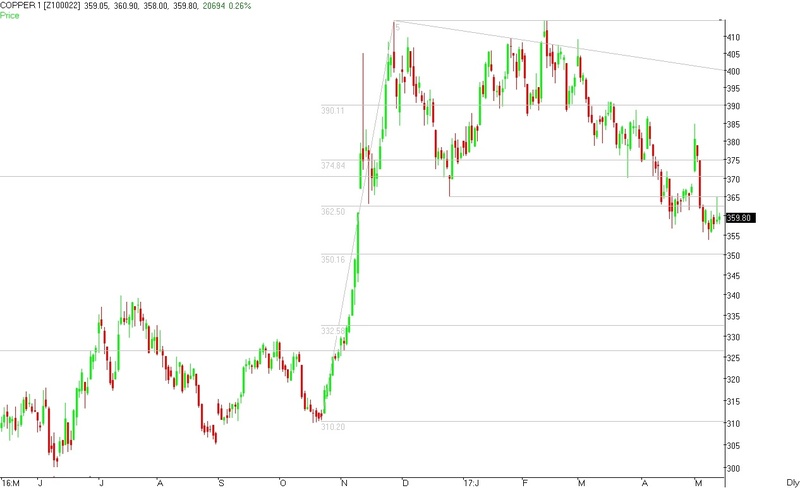 As we have mentioned last week, that minor support for the commodity lies in the zone of 379 to 381. Support for the commodity lies in the zone of 375 to 376 where Fibonacci levels and medium term moving averages are lying. If the commodity manages to close below these levels then the commodity can drift to the levels of 370 to 372 where 200 Daily moving averages and Fibonacci levels are lying. 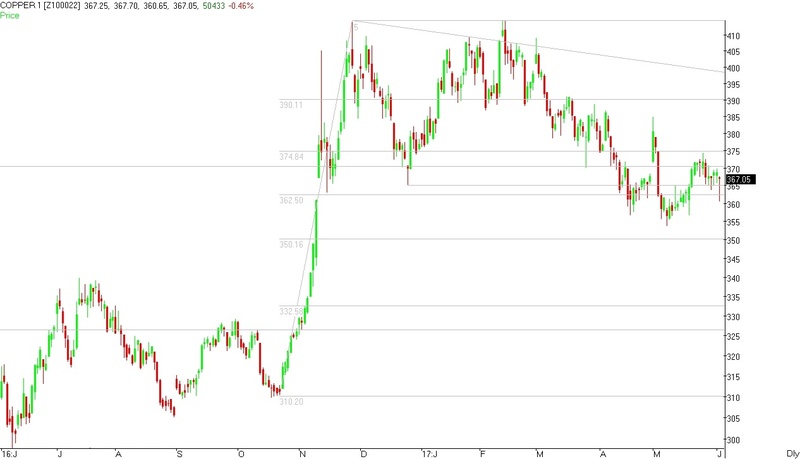 During the week the commodity manages to hit a low of 376 and close the week around the levels of 384. Minor support for the commodity lies in the zone of 379 to 381. Support for the commodity lies in the zone of 375 to 376 where Fibonacci levels and medium term moving averages are lying. If the commodity manages to close below these levels then the commodity can drift to the levels of 370 to 372 where 200 Daily moving averages and Fibonacci levels are lying. 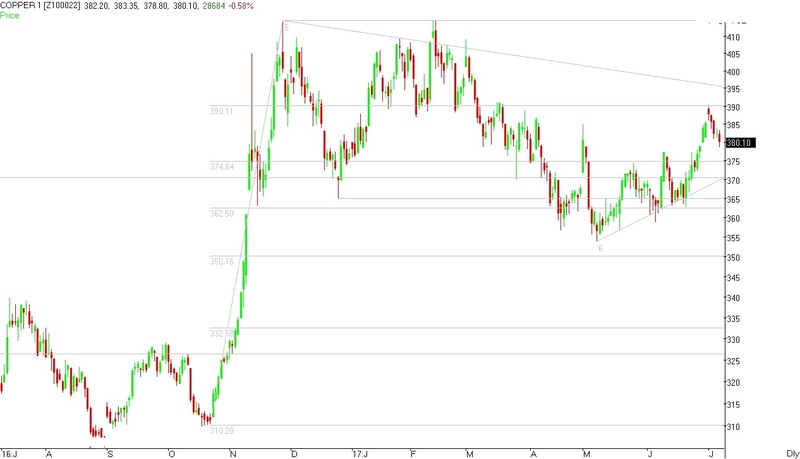 Broad range for the commodity in the coming week can be seen between 370 – 372 on downside & 393 – 395 on upside. COPPER (380.10) closed the week on negative note losing around 1.30%. As we have mentioned last week, that resistance for the commodity lies in the zone of 385 to 387 where the commodity has formed a top in the month of May-2017. 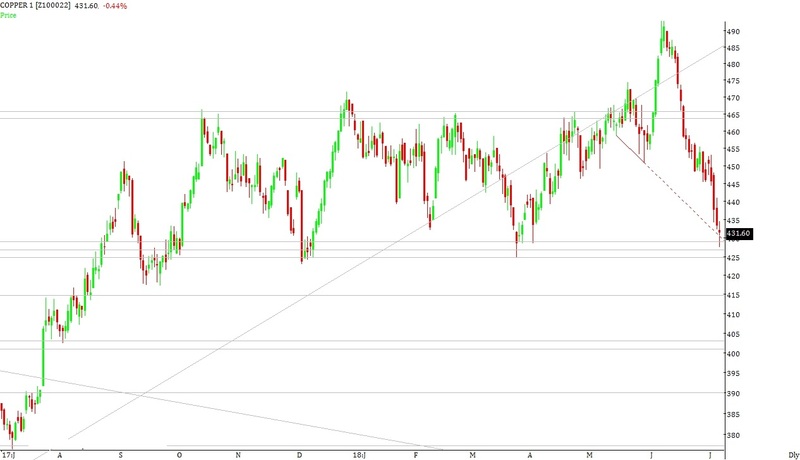 If the commodity manages to close above these levels then the commodity can move to the levels of 390 to 391 where Fibonacci levels are lying. 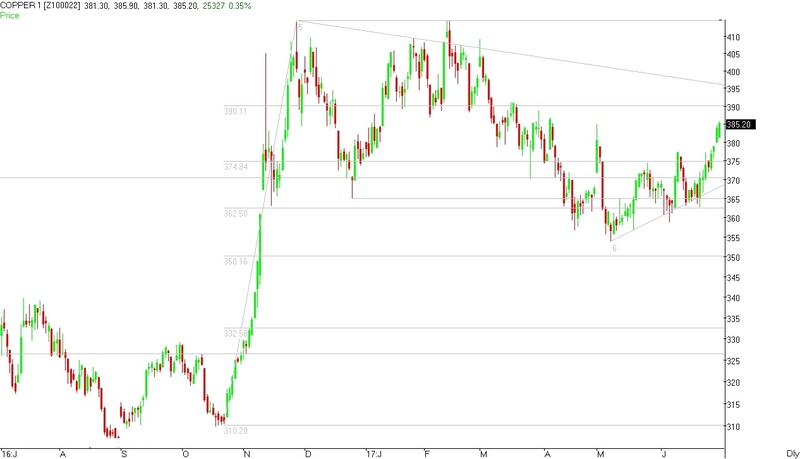 During the week the commodity manages to hit a high of 390 and close the week around the levels of 380. COPPER (373.80) closed the week on positive note gaining around 2.30%. As we have mentioned last week that support for the commodity lies in the zone of 361 to 363 where Fibonacci level are lying. If the commodity manages to close below these levels then the commodity can witness a freefall and can drift to the levels of 350 to 352. During the week the commodity manages to hit a low of 363 and close the week around the levels of 374. Support for the commodity lies in the zone of 368 to 370 where 200 Daily moving averages and Fibonacci levels are lying. If the commodity manages to close below these levels then the commodity can drift to the levels of 361 to 363 where Fibonacci level are lying. Resistance for the commodity lies in the zone of 375 to 377 where Fibonacci levels and medium term moving averages are lying. If the commodity manages to close above these levels then the commodity can move to the levels of 385 to 387 where the commodity has formed a top in the month of May-2017. Broad range for the commodity in the coming week can be seen between 363 – 365 on downside & 385 – 387 on upside. COPPER (365.45) closed the week on negative note losing around 3.10%. 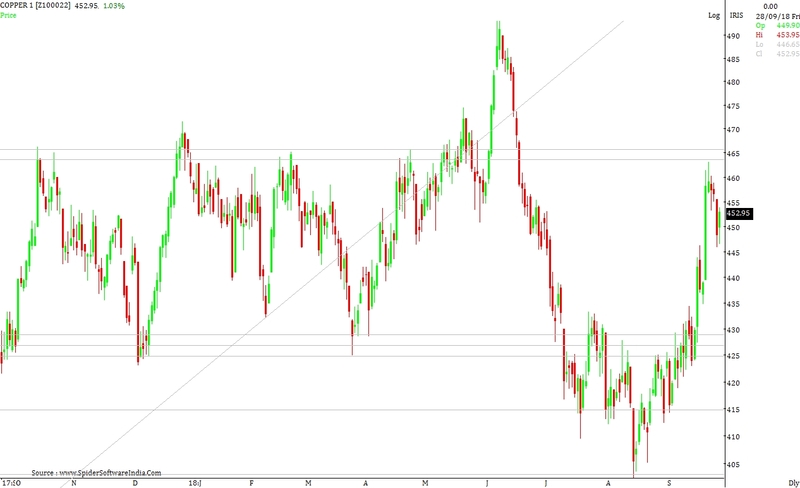 As we have mentioned last week that minor support for the commodity lies in the zone of 375 to 376. Support for the commodity lies in the zone of 368 to 370 where 200 Daily moving averages and Fibonacci levels are lying. If the commodity manages to close below these levels then the commodity can drift to the levels of 361 to 363 where Fibonacci level are lying. During the week the commodity manages to hit a low of 363 and close the week around the levels of 365. 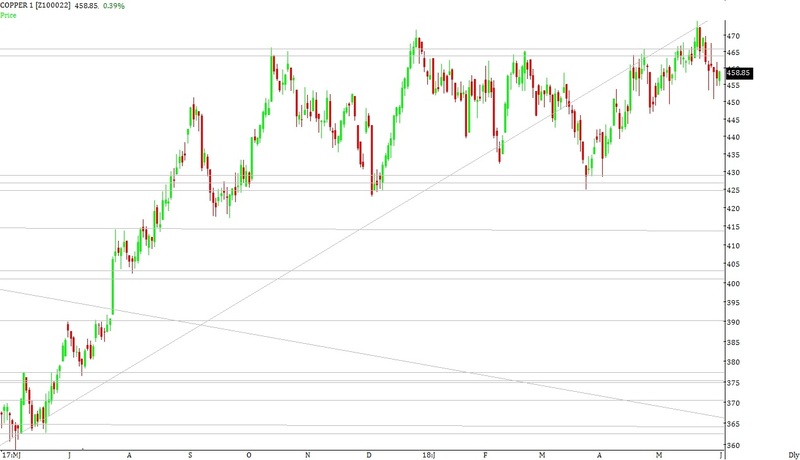 Support for the commodity lies in the zone of 361 to 363 where Fibonacci level are lying. If the commodity manages to close below these levels then the commodity can witness a freefall and can drift to the levels of 350 to 352. Resistance for the commodity lies in the zone of 368 to 370 where 200 Daily moving averages and Fibonacci levels are lying. If the commodity manages to close above these levels then the commodity can move to the levels of 375 to 377 where Fibonacci levels are lying. 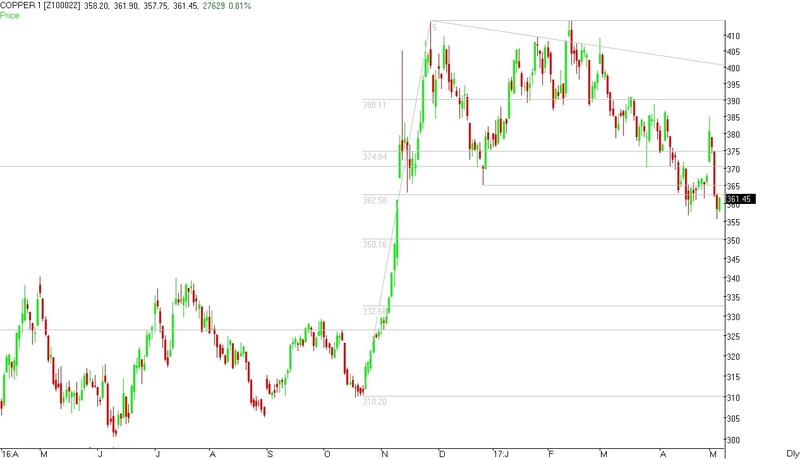 Broad range for the commodity in the coming week can be seen between 350 – 352 on downside & 375 – 377 on upside. COPPER (367.05) closed the week on absolutely flat note. As we have mentioned last week that resistance for the commodity lies in the zone of 368 to 370 where Fibonacci levels are lying. 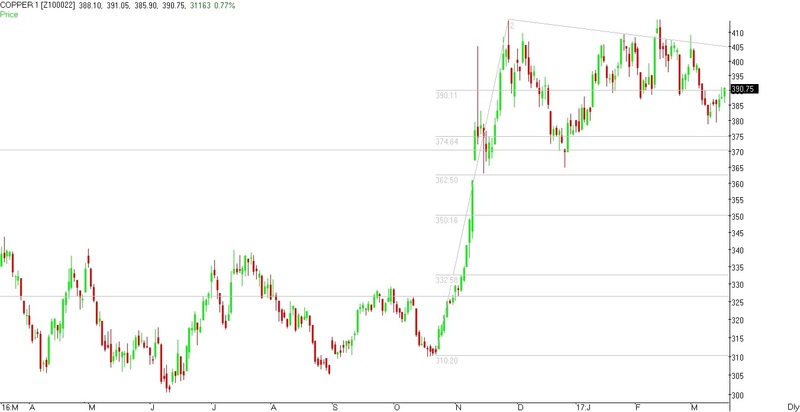 If the commodity manages to close above these levels then the commodity can move to the levels of around 375 to 377 from where the commodity broke down and Fibonacci level are lying. 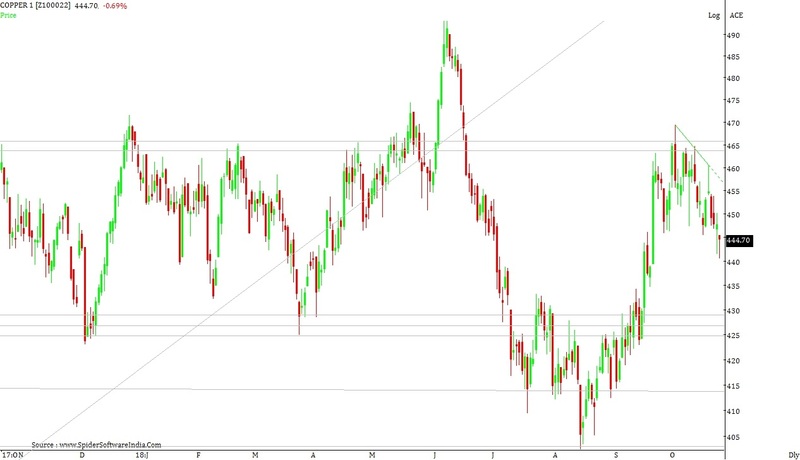 During the week the commodity manages to hit a high of 371 and close the week around the levels of 367. Support for the commodity lies in the zone of 365 to 366 where 200 Daily moving averages are lying. 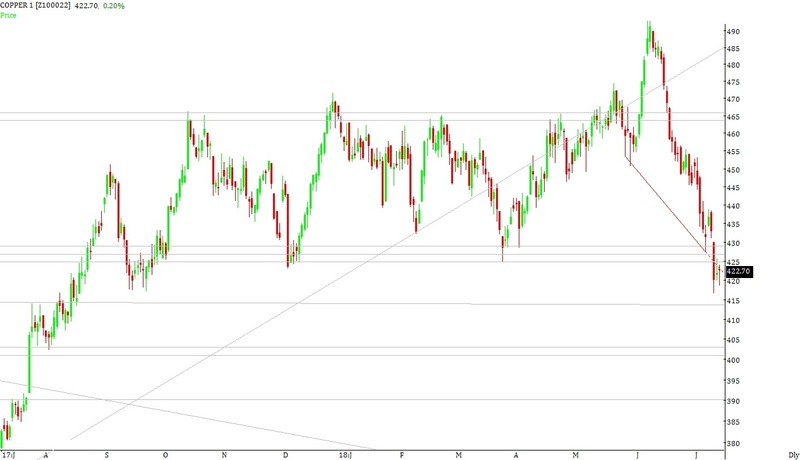 Support for the commodity lies in the zone of 361 to 363 where Fibonacci level are lying. If the commodity manages to close below these levels then the commodity can drift to the levels of 350 to 351 where long term Fibonacci level is lying. COPPER (369.55) closed the week on positive note gaining around 2.70%. As we have mentioned last week that minor resistance for the commodity lies in the zone of 362 to 364. 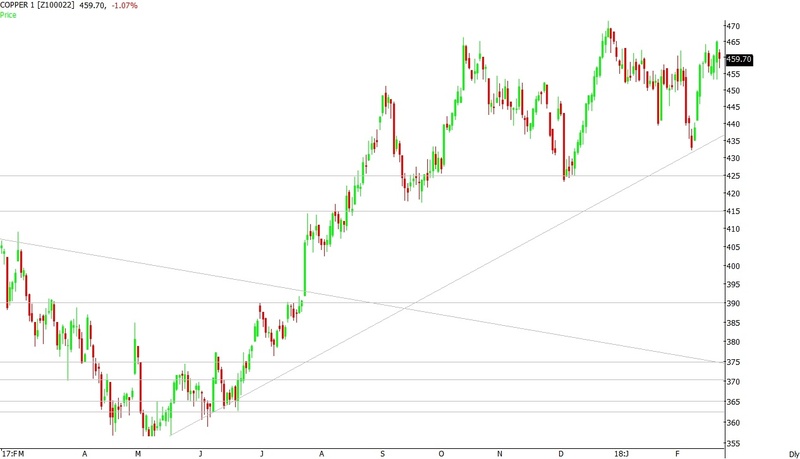 Resistance for the commodity lies in the zone of 368 to 370 where Fibonacci levels are lying. 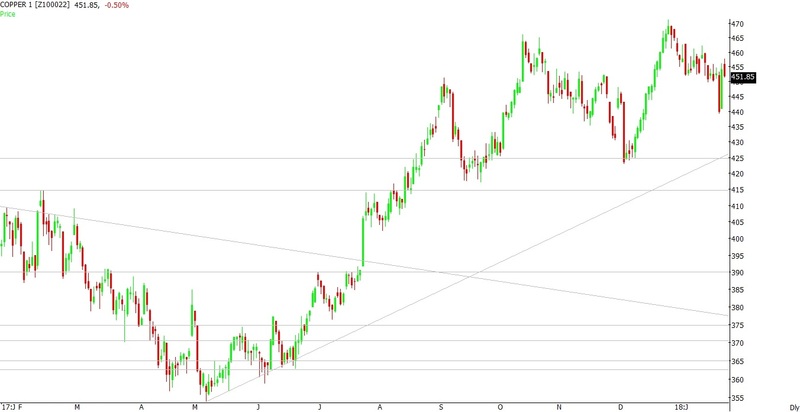 If the commodity manages to close above these levels then the commodity can move to the levels of around 375 to 377 from where the commodity broke down and Fibonacci level are lying. During the week the commodity manages to hit a high of 370 and close the week around the levels of 369. 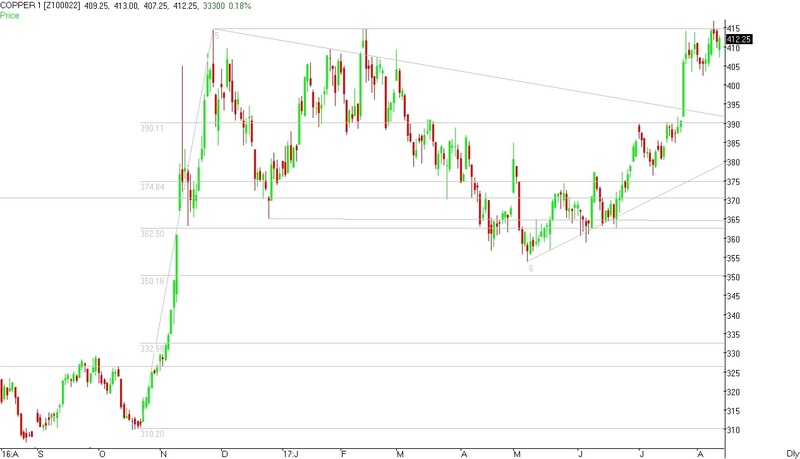 Broad range for the commodity in the coming week can be seen between 360 – 362 on downside & 377 – 380 on upside. COPPER (359.80) closed the week on negative note losing around 0.50%. As we have mentioned last week that minor resistance for the commodity lies in the zone of 364 to 365. 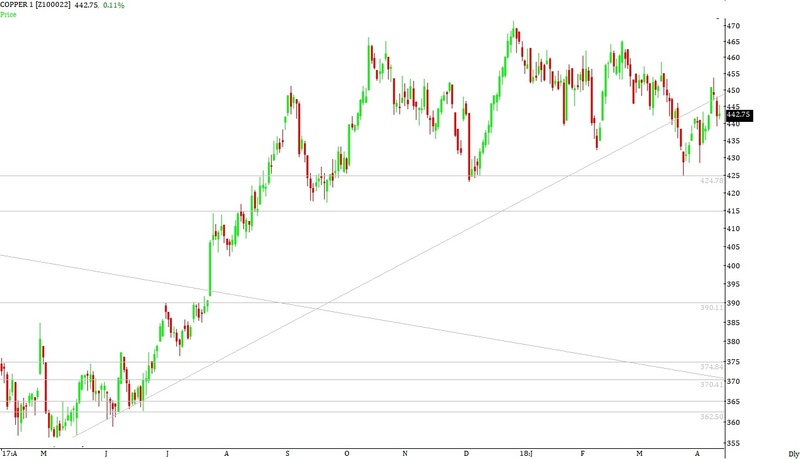 Resistance for the commodity lies in the zone of 368 to 370 where Fibonacci levels are lying. 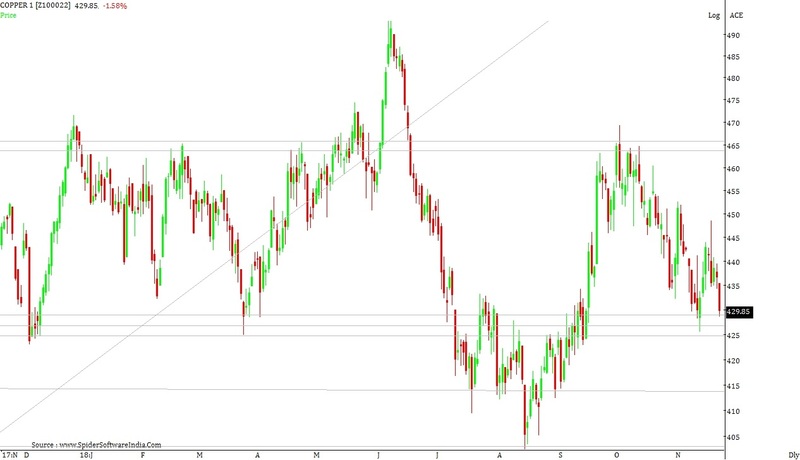 If the commodity manages to close above these levels then the commodity can move to the levels of around 375 to 377 from where the commodity broke down and Fibonacci level are lying. During the week the commodity manages to hit a high of 365 and close the week around the levels of 360. Minor support for the commodity lies in the zone of 354 to 356. 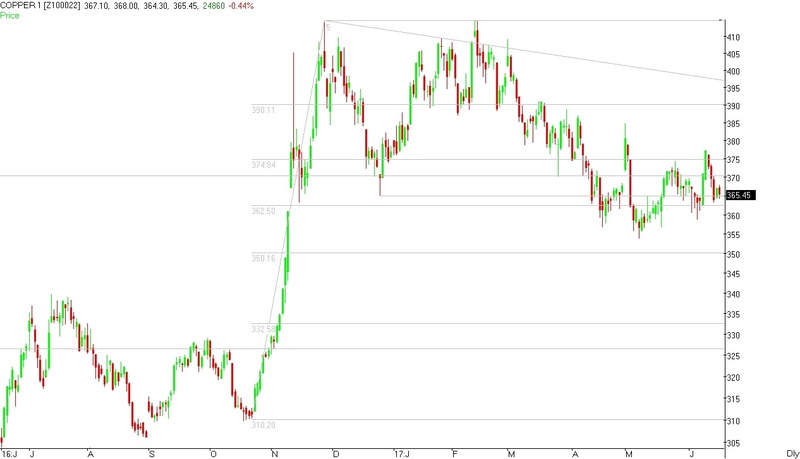 Support for the commodity lies in the zone of 350 to 351 where long term Fibonacci level is lying. 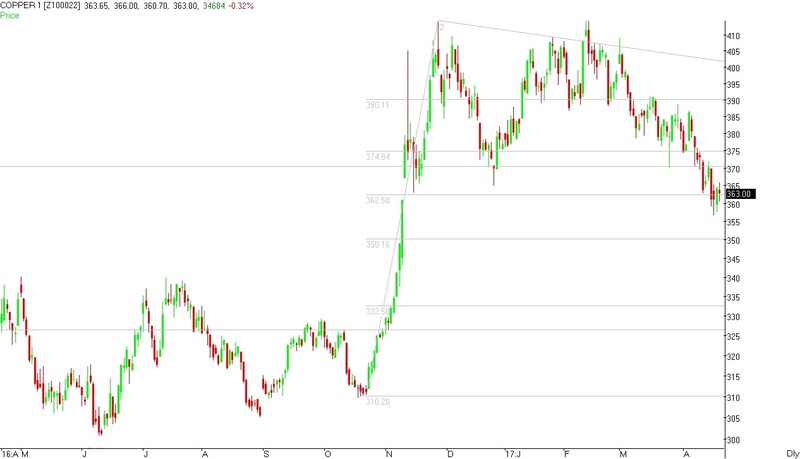 If the commodity manages to close below these levels then the commodity can drift to the levels of 343 to 345. Minor resistance for the commodity lies in the zone of 362 to 364. 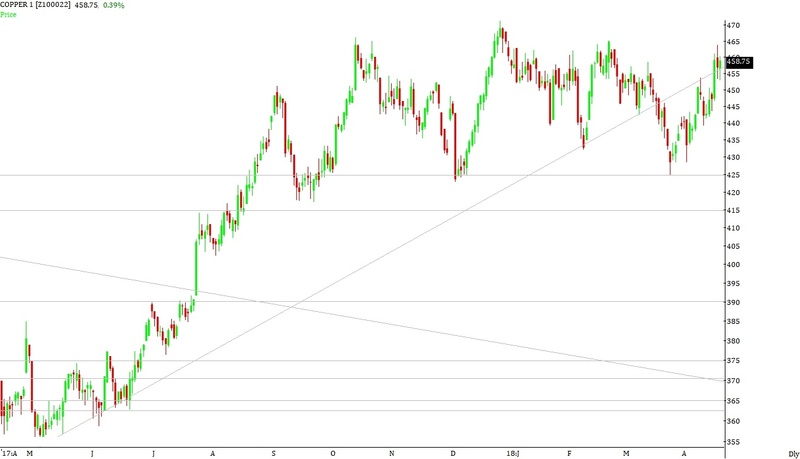 Resistance for the commodity lies in the zone of 368 to 370 where Fibonacci levels are lying. 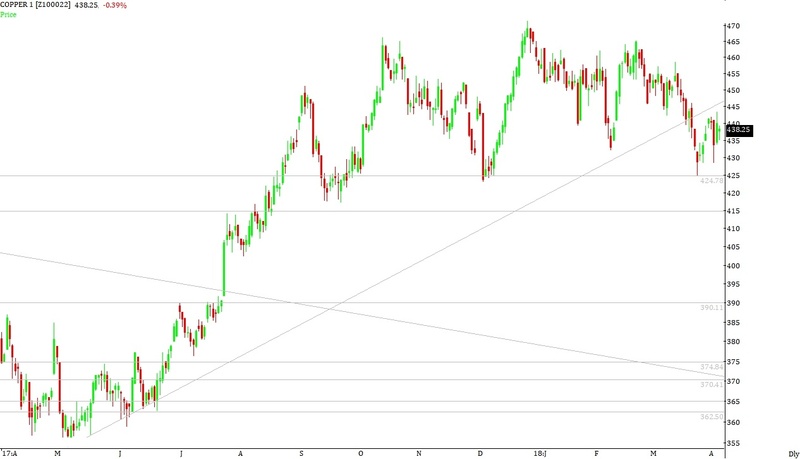 If the commodity manages to close above these levels then the commodity can move to the levels of around 375 to 377 from where the commodity broke down and Fibonacci level are lying. 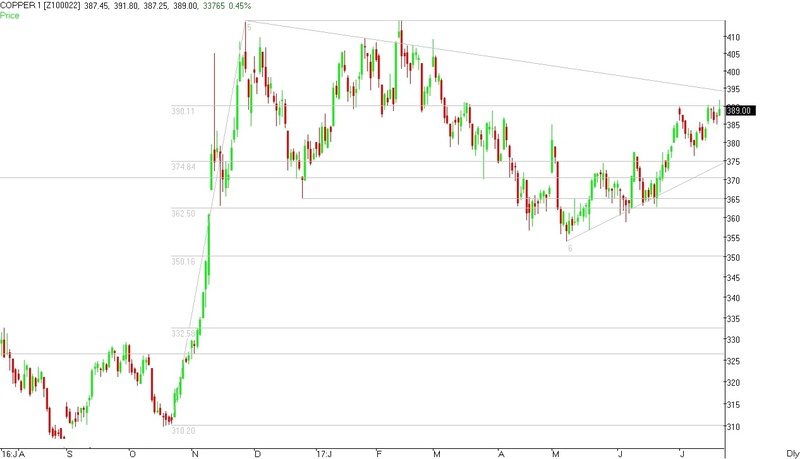 Broad range for the commodity in the coming week can be seen between 350 – 352 on downside & 372 – 375 on upside. COPPER (361.45) closed the week on negative note losing around 1.70%. As we have mentioned last week that minor support for the commodity lies in the zone of 364 to 365. Support for the commodity lies in the zone of 360 to 362 where the commodity has taken support in the month of November-2016 and 200 Daily moving averages are lying. If the commodity manages to close below these levels then the commodity can drift to the levels of 350 to 352 where Fibonacci level is lying. During the week the commodity manages to hit a low of 356 and close the week around the levels of 361. Support for the commodity lies in the zone of 360 to 362 where the commodity has taken support in the month of November-2016 and 200 Daily moving averages are lying. If the commodity manages to close below these levels then the commodity can drift to the levels of 350 to 352 where Fibonacci level is lying. Minor resistance for the commodity lies in the zone of 364 to 365. 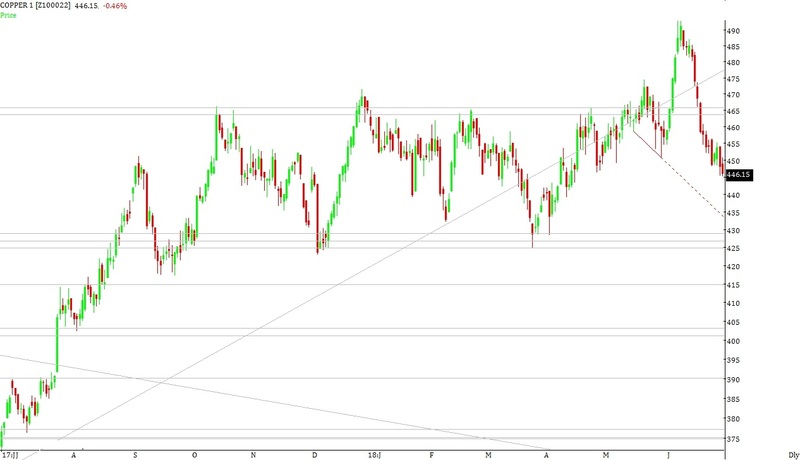 Resistance for the commodity lies in the zone of 368 to 370 where Fibonacci levels are lying. 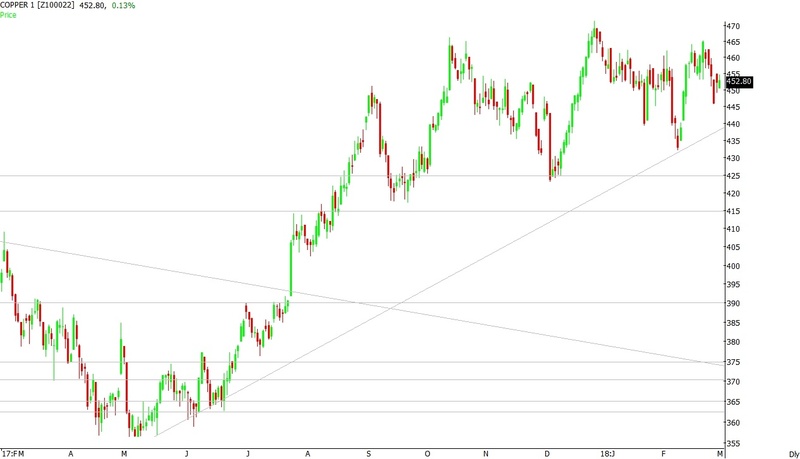 If the commodity manages to close above these levels then the commodity can move to the levels of around 375 to 377 from where the commodity broke down and Fibonacci level are lying. COPPER (363.00) closed the week on negative note losing around 0.90%. As we have mentioned last week that support for the commodity lies in the zone of 362 to 364 where the commodity has taken support in the month of November-2016 and December-2016. If the commodity manages to close below these levels then the commodity can drift to the levels of 358 to 360 where 200 Daily moving average is lying. During the week the commodity manages to hit a low of 357 and close the week around the levels of 363. COPPER (376.05) closed the week on negative note losing around 1.20%. As we have mentioned last week that support for the commodity lies in the zone of 380 to 382 where the commodity has taken support on couple of occasions. If the commodity manages to close below these levels then the commodity can drift to the levels of 375 to 376 where Fibonacci level is lying. 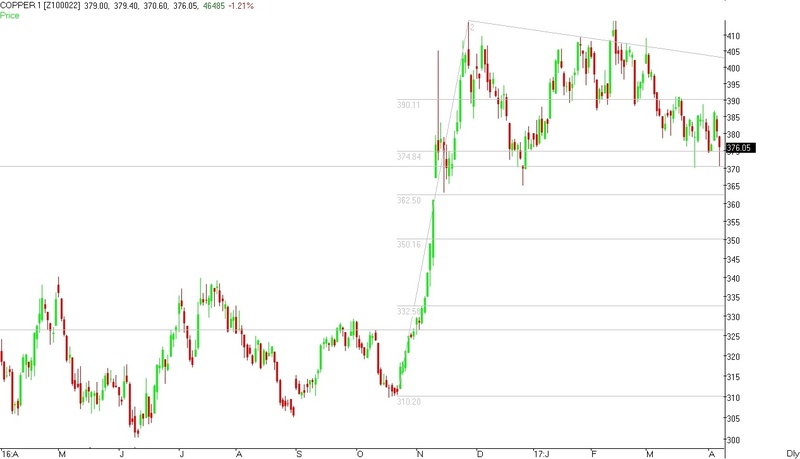 Below these levels the commodity can drift to the levels of 370 to 372 where long term Fibonacci level is lying. 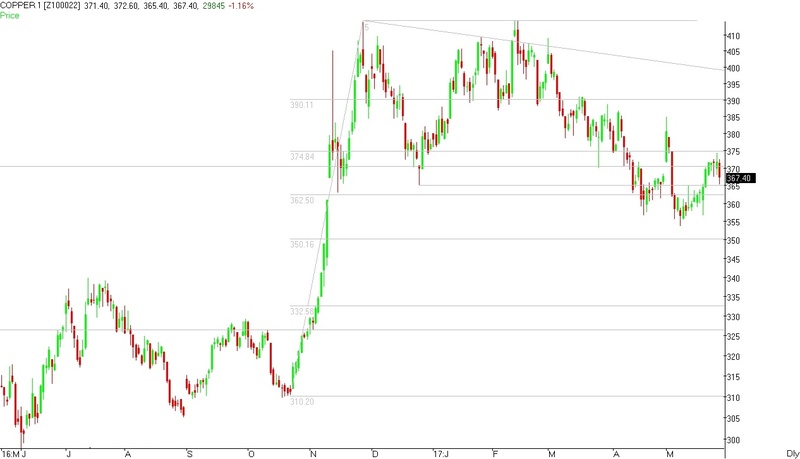 During the week the commodity manages to hit a low of 371 and close the week around the levels of 376. 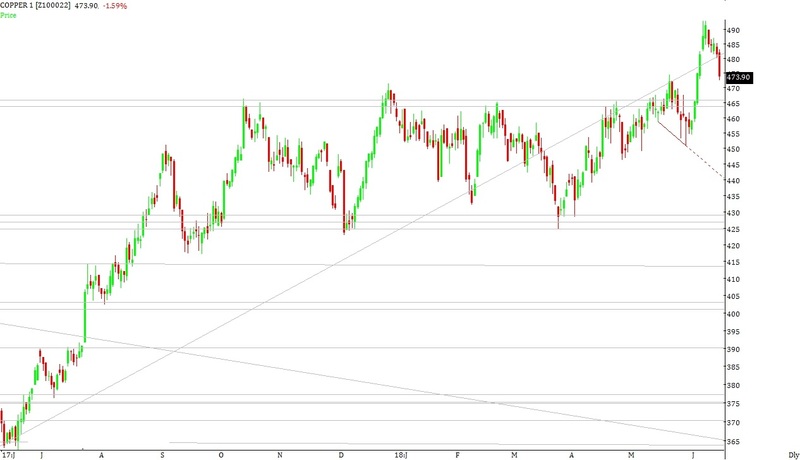 Support for the commodity lies in the zone of 375 to 376 where Fibonacci level is lying. 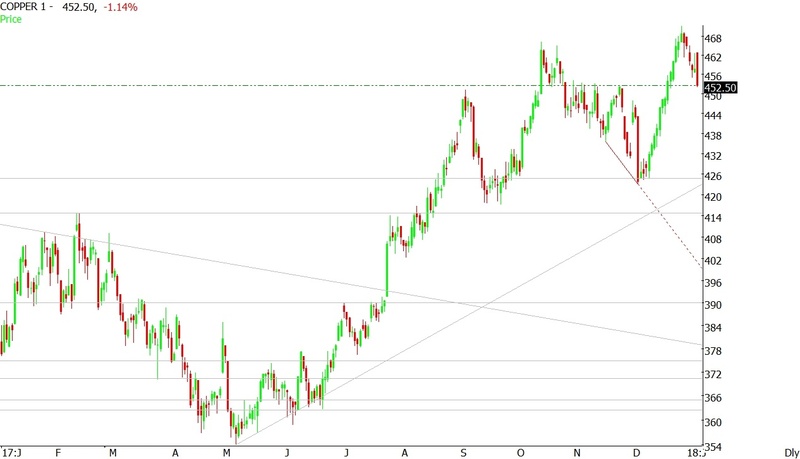 If the commodity manages to close below these levels then the commodity can drift to the levels of 370 to 372 where long term Fibonacci level is lying. Below these levels the commodity can drift to the levels of 362 to 364 where the commodity has taken support in the month of November-2016 and December-2016. 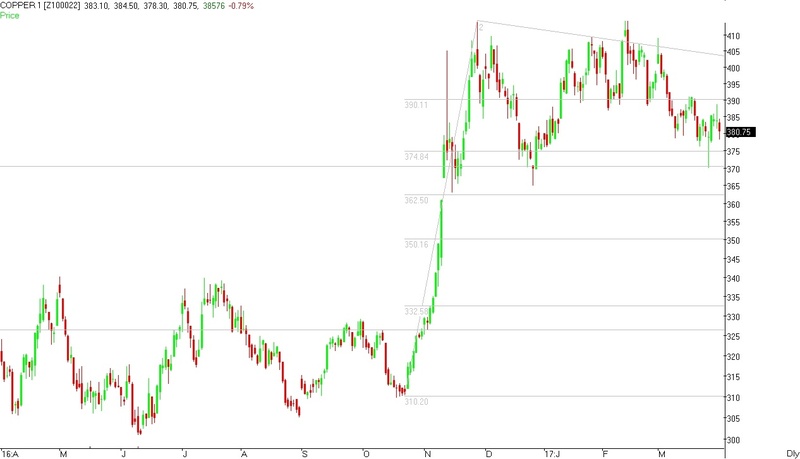 Minor resistance for the commodity lies in the zone of 379 to 381. 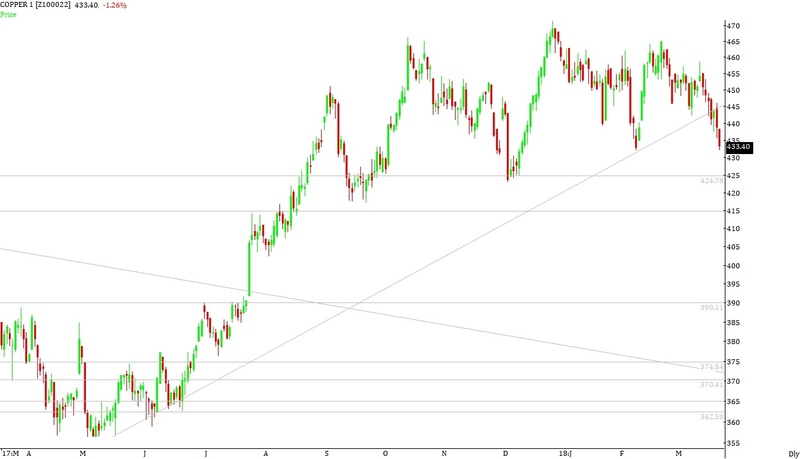 Resistance for the commodity lies in the zone of 388 to 390 where Fibonacci levels are lying. If the commodity manages to close above these levels then the commodity can move to the levels of around 393 to 395 where short term moving averages are lying. Broad range for the commodity in the coming week can be seen between 362 – 364 on downside & 383 – 385 on upside. COPPER (380.75) closed the week on absolutely flat note. As we have mentioned last week that minor resistance for the commodity lies in the zone of 384 to 385. 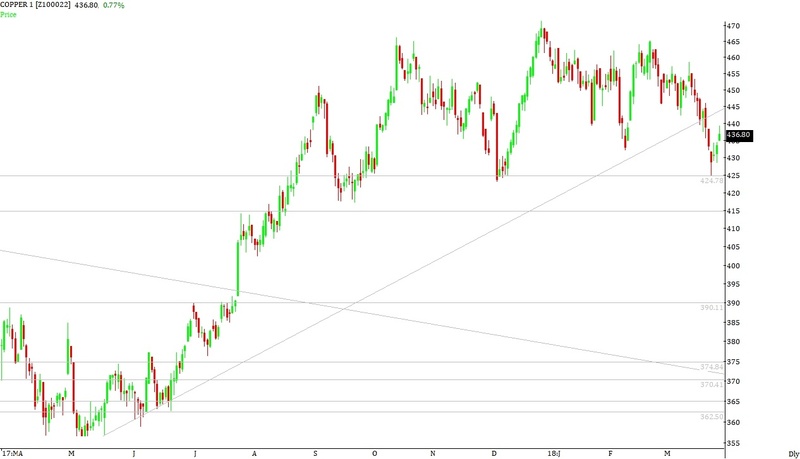 Resistance for the commodity lies in the zone of 388 to 390 where Fibonacci levels are lying. If the commodity manages to close above these levels then the commodity can move to the levels of around 393 to 395 where short term moving averages are lying. 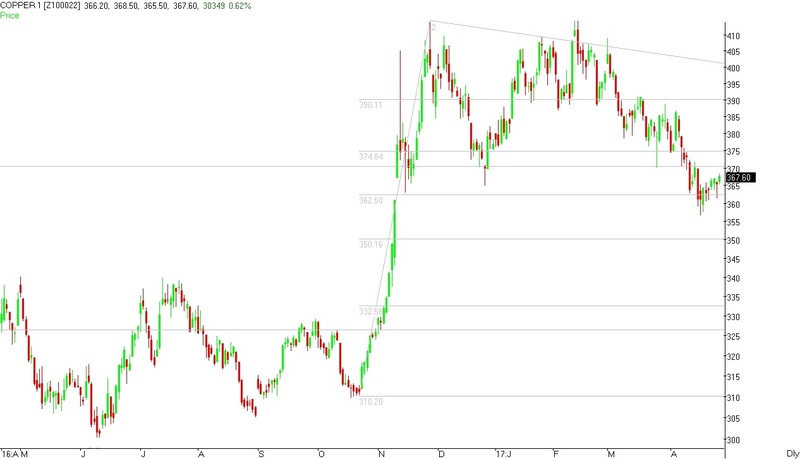 During the week the commodity manages to hit a high of 389 and close the week around the levels of 381. Support for the commodity lies in the zone of 380 to 382 where the commodity has taken support on couple of occasions. If the commodity manages to close below these levels then the commodity can drift to the levels of 375 to 376 where Fibonacci level is lying. 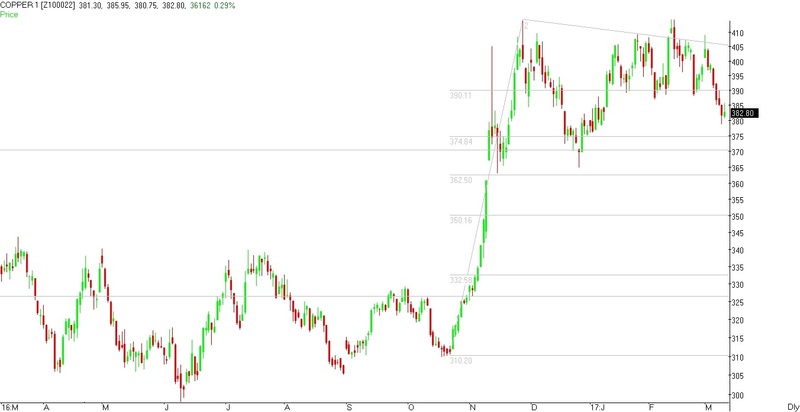 Below these levels the commodity can drift to the levels of 370 to 372 where long term Fibonacci level is lying. Minor resistance for the commodity lies in the zone of 384 to 385. 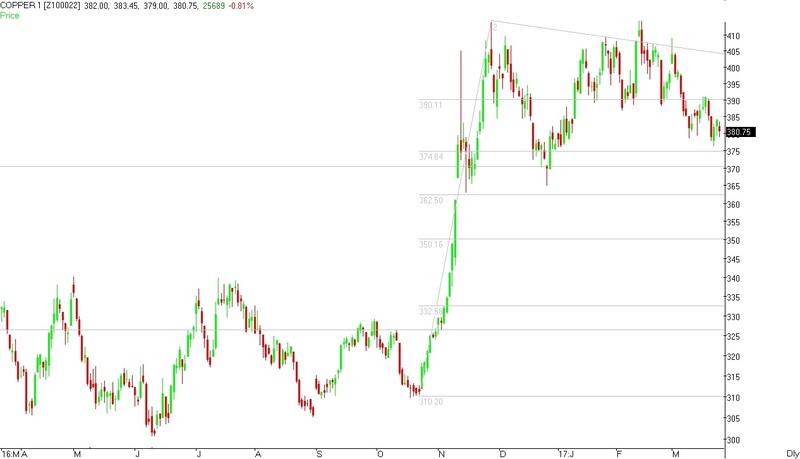 Resistance for the commodity lies in the zone of 388 to 390 where Fibonacci levels are lying. If the commodity manages to close above these levels then the commodity can move to the levels of around 393 to 395 where short term moving averages are lying. 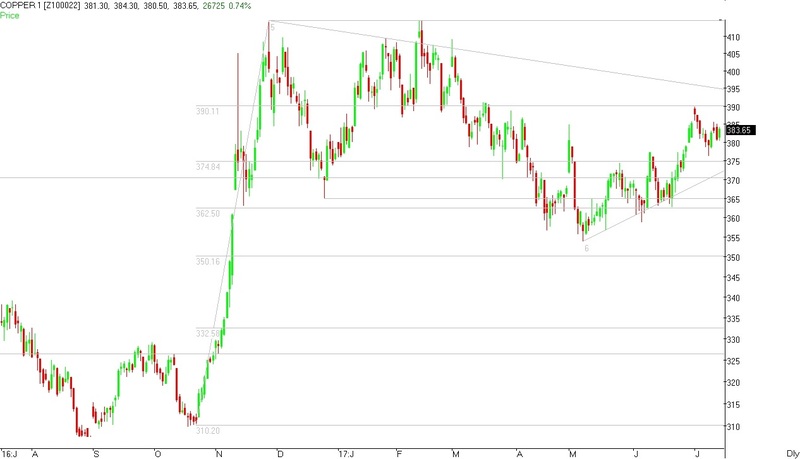 Broad range for the commodity in the coming week can be seen between 370 – 372 on downside & 388 – 390 on upside. COPPER (380.75) closed the week on a negative note losing around 2.60%. 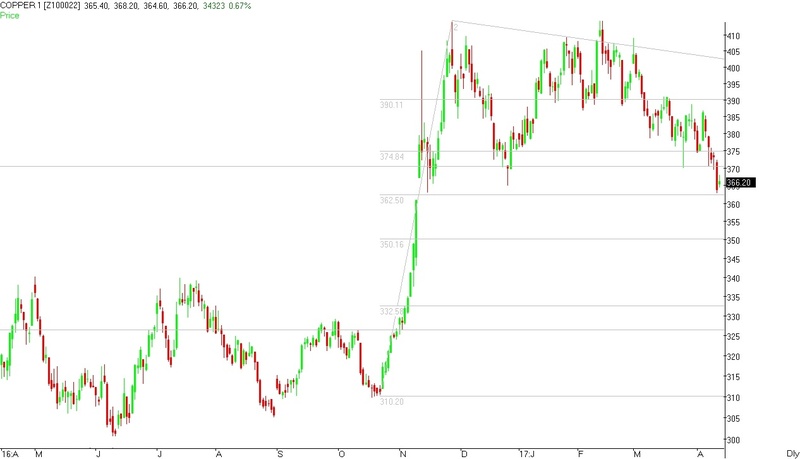 As we have mentioned last week that minor support for the commodity lies in the zone of 386 to 388. Support for the commodity lies in the zone of 380 to 382 where the commodity has taken support on couple of occasions. If the commodity manages to close below these levels then the commodity can drift to the levels of 375 to 377 where Fibonacci level is lying. During the week the commodity manages to hit a low of 376 and close the week around the levels of 381. Support for the commodity lies in the zone of 380 to 382 where the commodity has taken support on couple of occasions. If the commodity manages to close below these levels then the commodity can drift to the levels of 375 to 376 where Fibonacci level is lying. 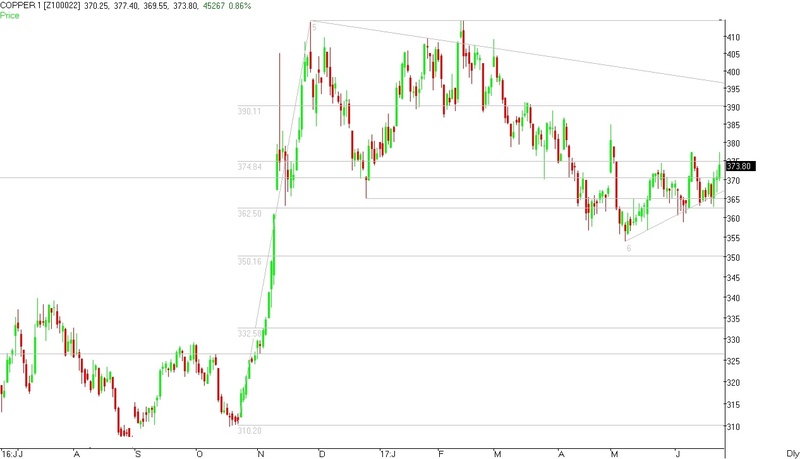 Broad range for the commodity in the coming week can be seen between 375 – 377 on downside & 388 – 390 on upside. COPPER (400.20) closed the week with a negative note losing around 1.95% . 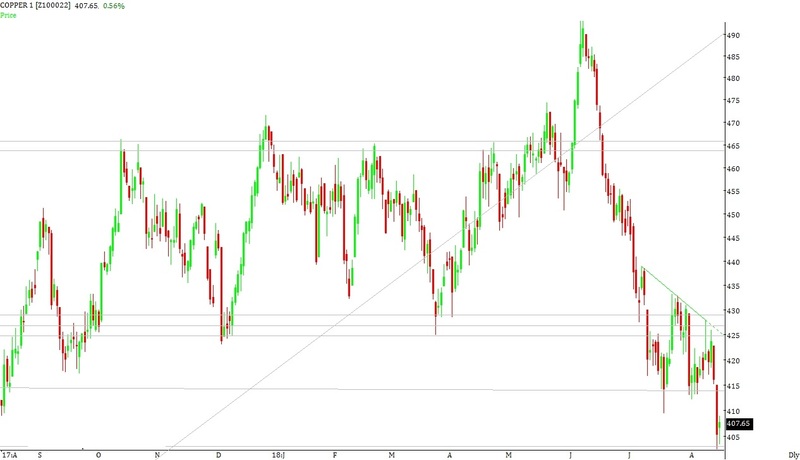 As we have mentioned last week that the commodity has closed around the resistance zone of 408 to 409 where trend-line joining highs of 414.80 and 409.50 is lying. Resistance for the commodity lies in the zone of 414 to 416 where the commodity has made a high in the month of November-2016. If the commodity manages to close above these levels then the commodity can move to the levels of 422 to 425 where monthly Fibonacci levels are lying and from where the commodity sold off in the month of May-2015. 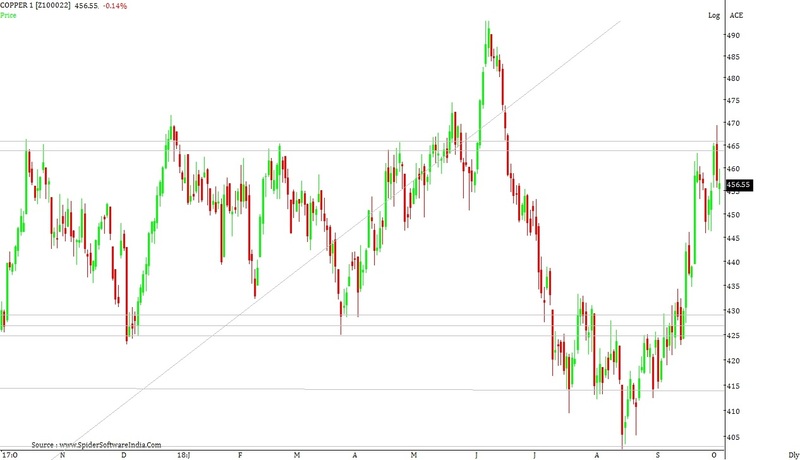 During the week the commodity manages to hit a high of 414.75 and close the week around the levels of 400.20. 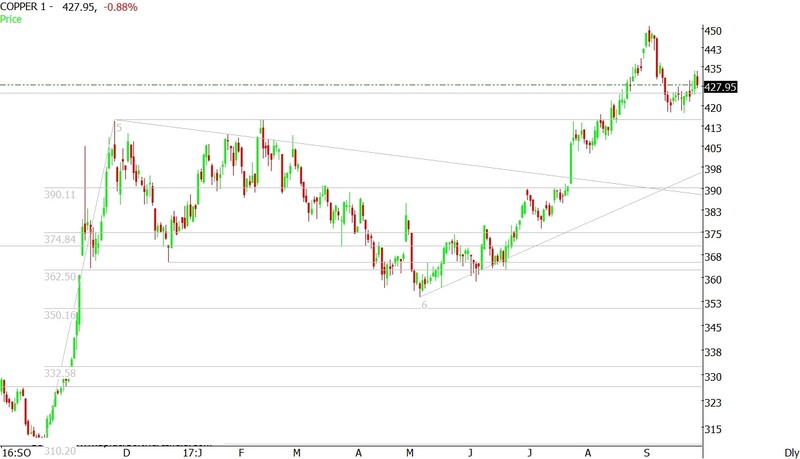 Resistance for the commodity lies in the zone of 406 to 407 where trend-line joining highs of 414.80 and 409.50 is lying. If the commodity manages to close above these levels then the commodity can move to the levels of 414 to 416 where the commodity has made a high in the month of November-2016. 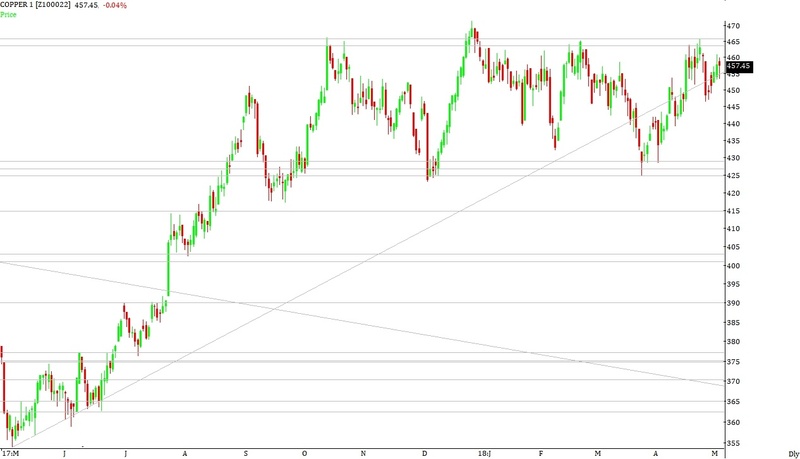 Broad range for the commodity in the coming week can be seen between 390 – 392 on downside and 408 – 410 on upside.